A little photo trickery to start the TR! 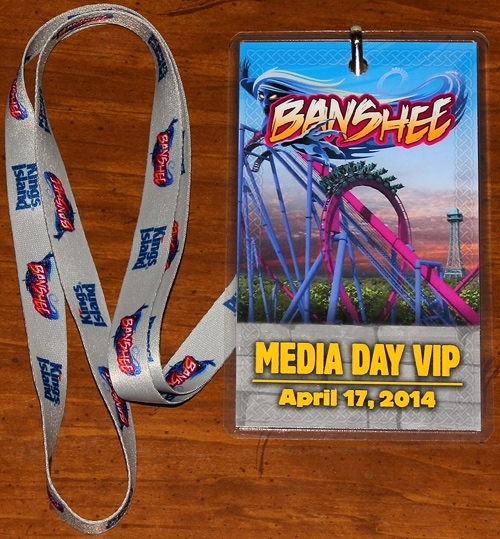 I had to take a quick break from my review of the 2013 TPR Texas/Midwest trip to jump to a slightly more recent event -- Banshee Media Day at Kings Island. This was the first media day event I've participated in, and I am very happy that I was able to go. These events make a lot of sense for everybody involved. 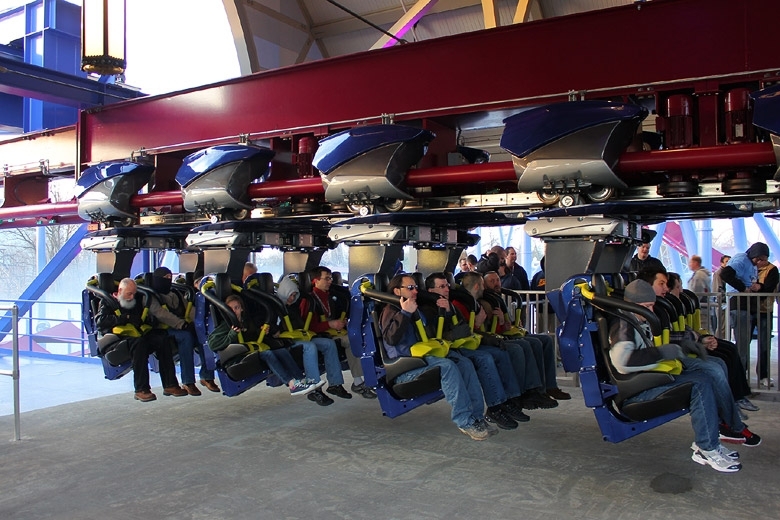 The park opens the new roller coaster for the media, who film and take pictures, covering the event on television and on the internet. The media wouldn't want to take pictures of empty coaster trains, so why not invite the enthusiast community to come along? 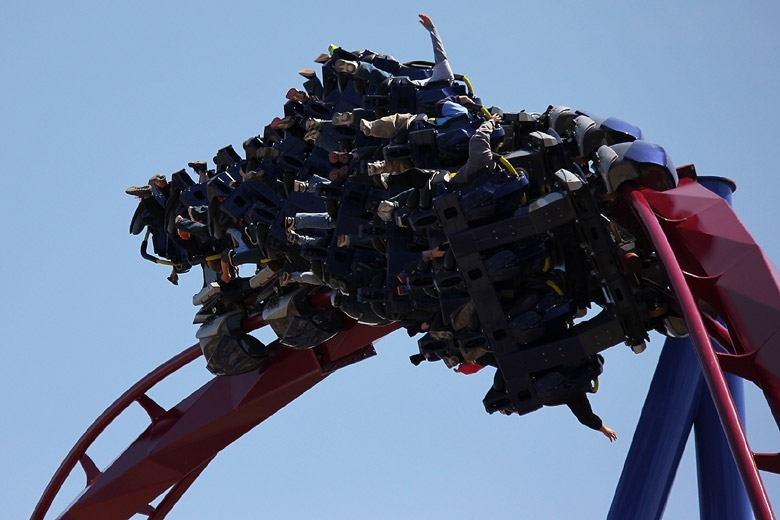 Through several coaster clubs and enthusiast groups, I'd estimate (very roughly) an attendance of around a thousand people, coming from three countries and 28 states. 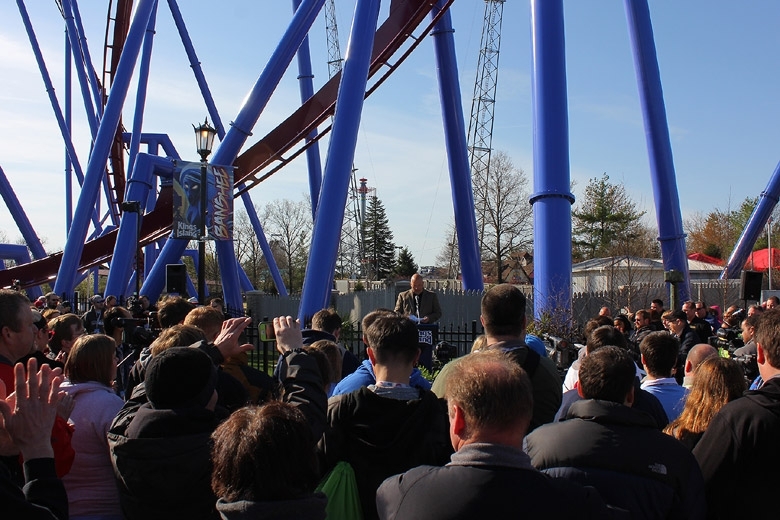 Furthermore, valuing the word-of-mouth publicity the enthusiast community can provide, the park made this an event worth attending for reasons well beyond a brand new multi-million dollar B&M. Here's a look at the gifts we all received. This is the front of the special media day lanyard we all received. Most people attending were "yellow taggers" -- working media and their friends and family were "pink taggers" with pink writing on the bottom. The back of the lanyard encouraged social media use, and there was so much going around on Twitter that I simply couldn't keep up. 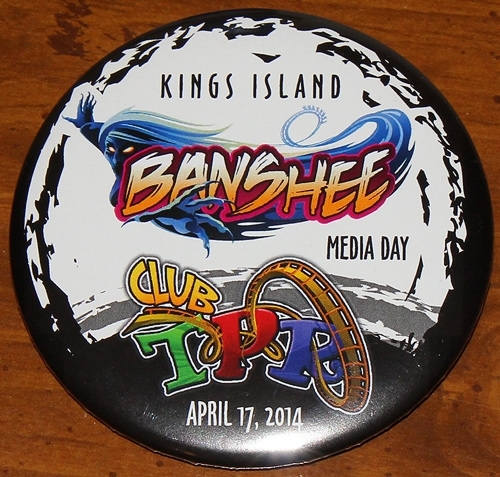 Here's a gift from Robb -- the official Club TPR Banshee Media Day button! These are pretty nice, and I saw several TPR members wearing them. A few non-TPR members even asked where we got them from. 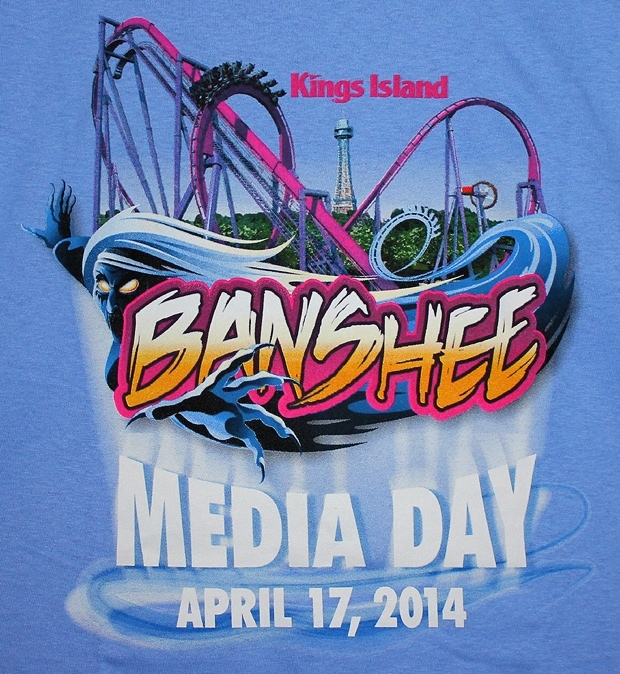 We also received Banshee Media Day shirts, which were provided in several sizes by the Kings Island staff at check-in. These are pretty nice, and definitely more scarce than the First Rider shirts that were given out the next day. 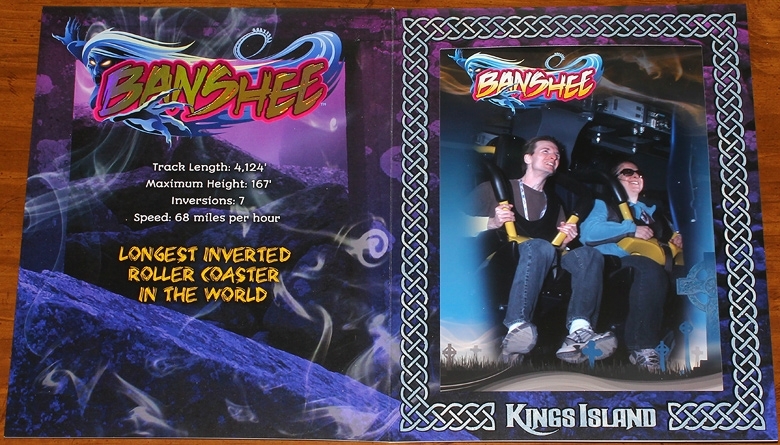 Everybody received a coupon for one free on-ride photo, and the design on the outside cover really ties the whole Banshee theme together. The inside contains a few stats and a continuation of the design elements. 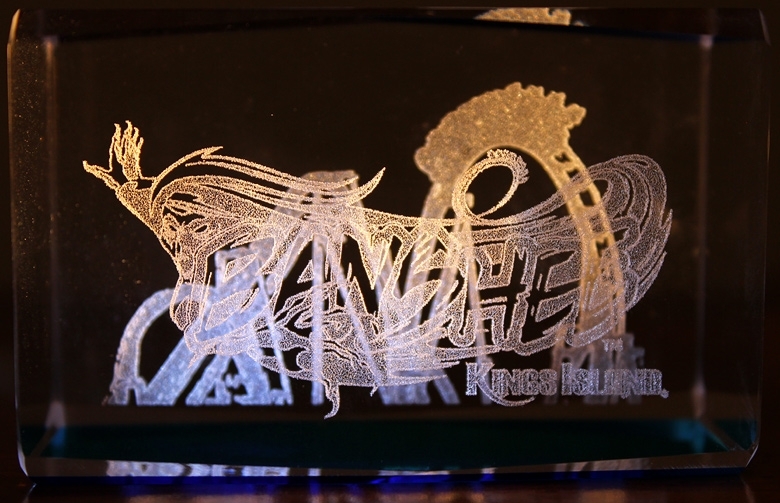 The word "Banshee" on both sides is printed in gold holographic foil. 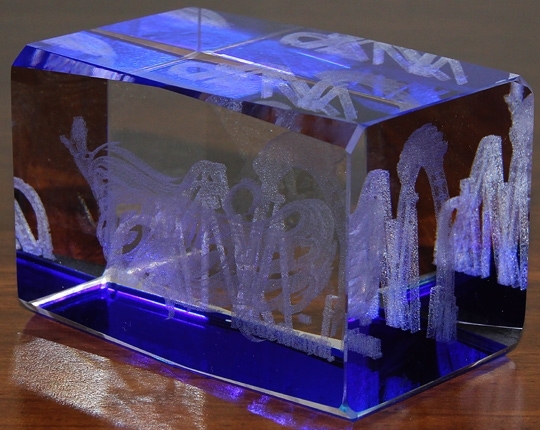 The final gift provided by the park was a glass paperweight, which I'd originally passed off as moderately interesting -- until I got home and took a closer look. 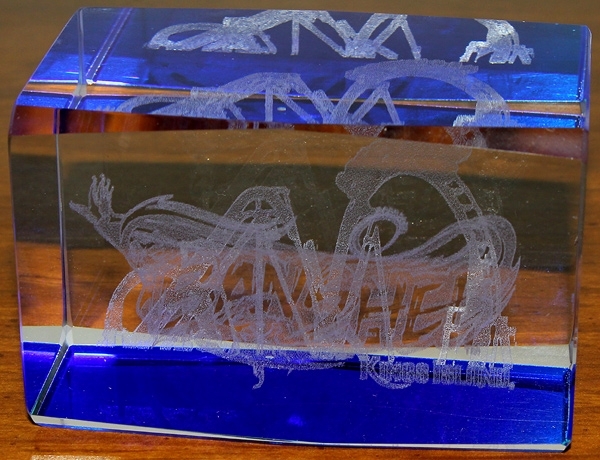 The bottom layer of the glass is colored blue, and there are two frosted areas on the inside -- one with the Banshee logo, and one with an outline of the coaster. 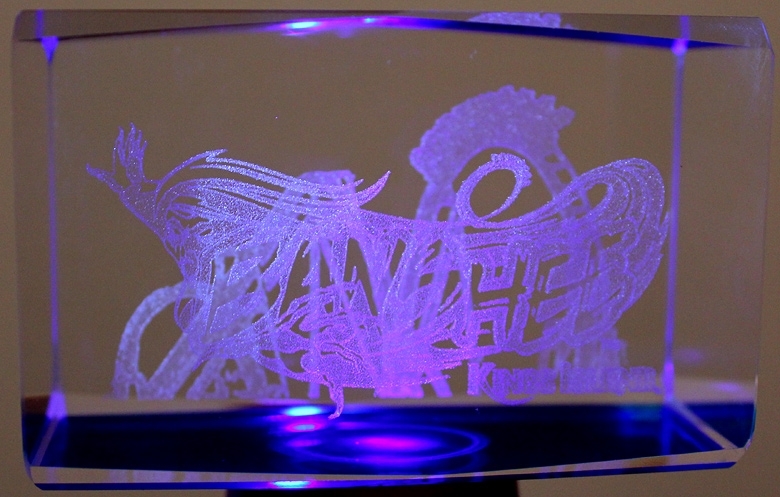 The glass emblem was tough to get a good picture of, but once I started experimenting with lighting, I was able to really unlock just how awesome the thing looked! 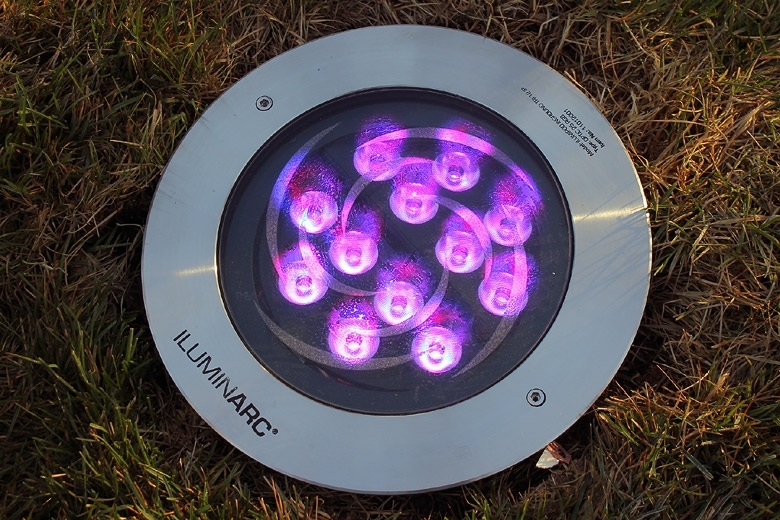 ...and a glowing blue version, lit up from below -- just because. The biggest complaint anyone could possibly have about media day was the cold conditions through the first half of the event. Low temperatures (near sunrise) were in the mid-30s, and without any buildings opened up, we all had to keep extra layers on and do our best o stay warm. 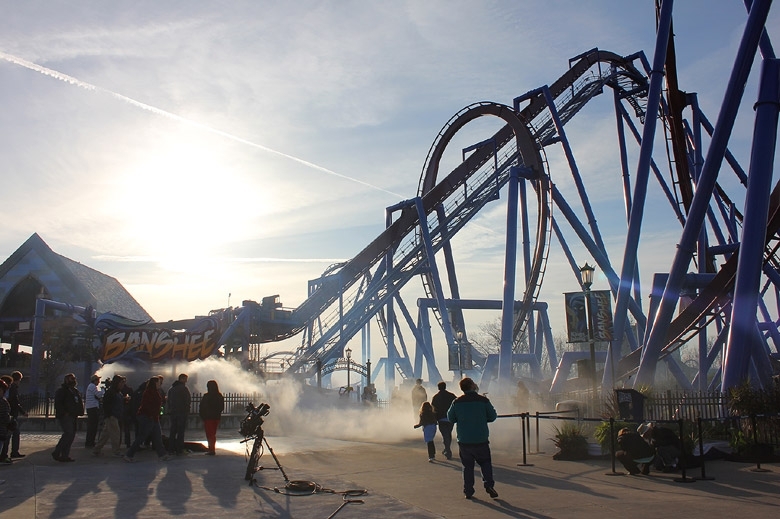 I know a thing or two about wind chill, and I just had to run the calculation -- Banshee (68 MPH) at sunrise (temperature of 35 degrees) worked out to a wind chill of about 16 degrees at its worst. 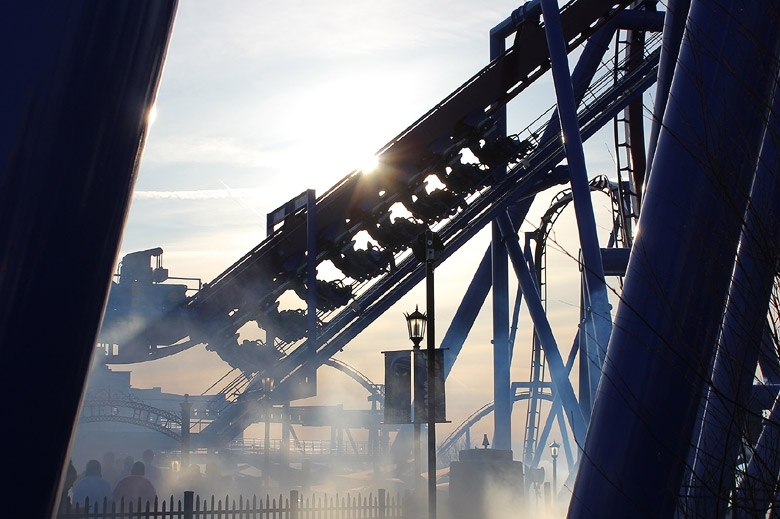 Easily the coldest coaster ride I've ever had, and with my first ride of the day at around 7 AM, it's also the earliest in the morning I've ever been on a ride. 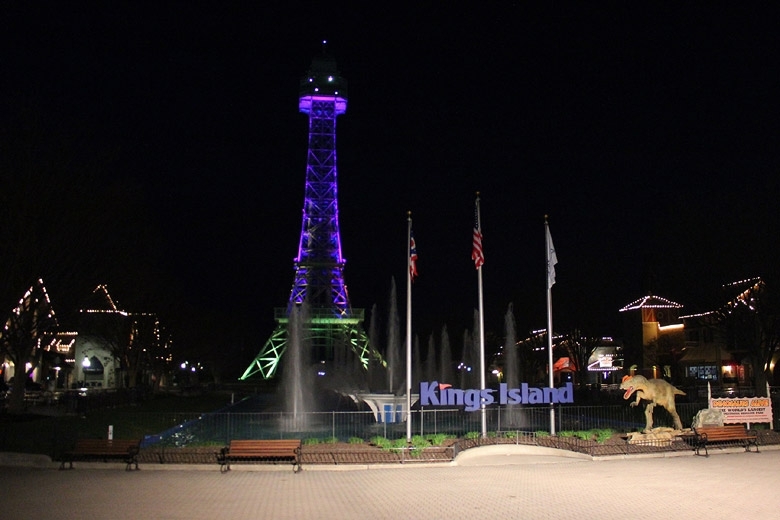 I have the advantage of living very close to the park -- only about 25 minutes from Kings Island. I arrived in the parking lot just after 5 PM. By that point, I found a huge line already in place, though everyone seemed to be in good spirits. 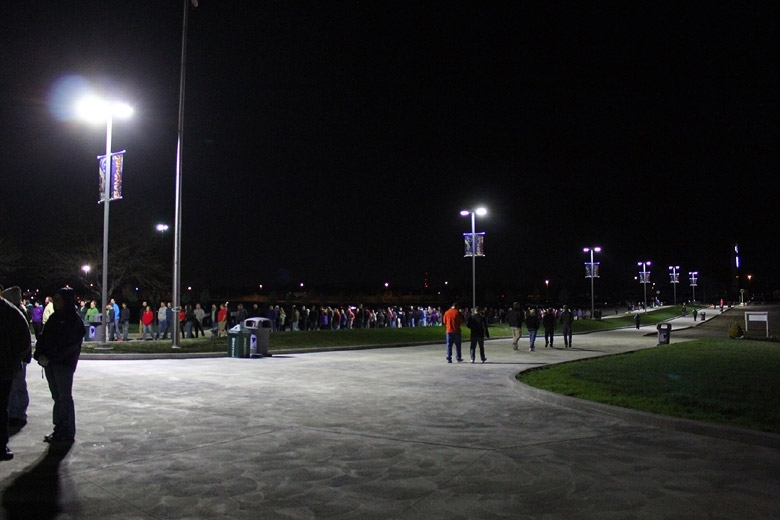 A weather guy from a Dayton TV station did a live shot from my area of the line, and those who were waiting and not asleep (myself not included) gave a few cheers to the bright lights of the camera. I got into the park about 45 minutes later, making a left turn and heading into the vastly-altered Action Zone. 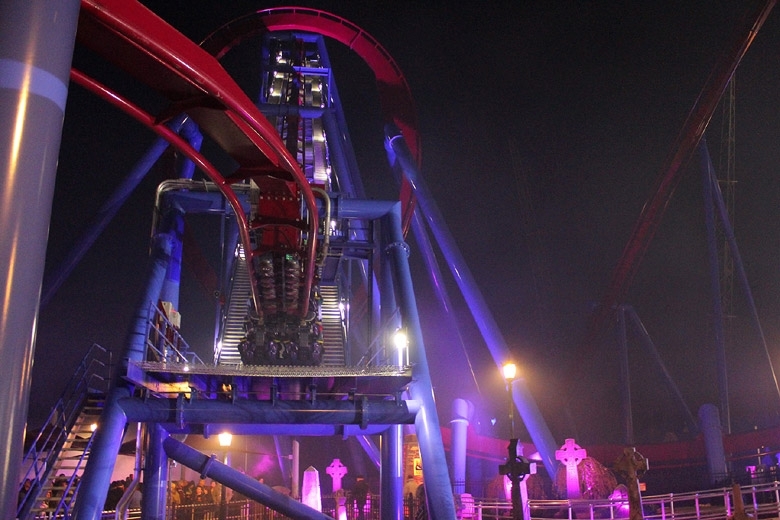 I had to take the chance for a few minutes of "night" photography before I rode Banshee for the first time, and I barely scratched the surface of the incredible photo opportunities the new area provides in the dark. 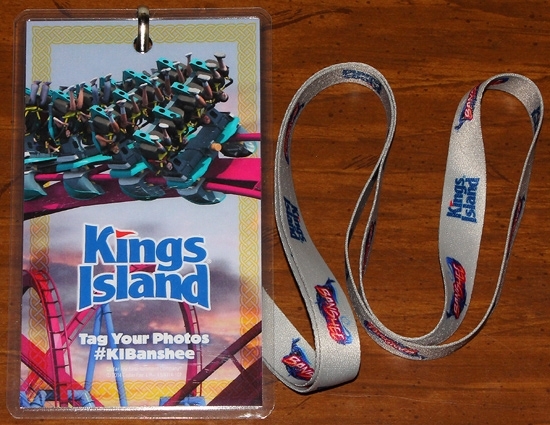 I put the camera away, had a quick chat with Robb, and got in line for Banshee. My first ride of the day required a wait of about 30 minutes, which would be the longest wait of the day. 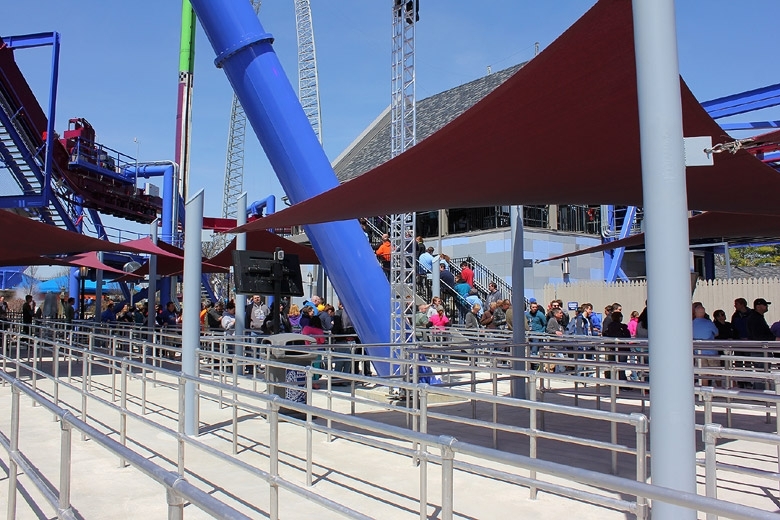 Though I was getting to the point of not being able to feel my fingers, it was great to get in my first coaster ride since last August at Cedar Point. 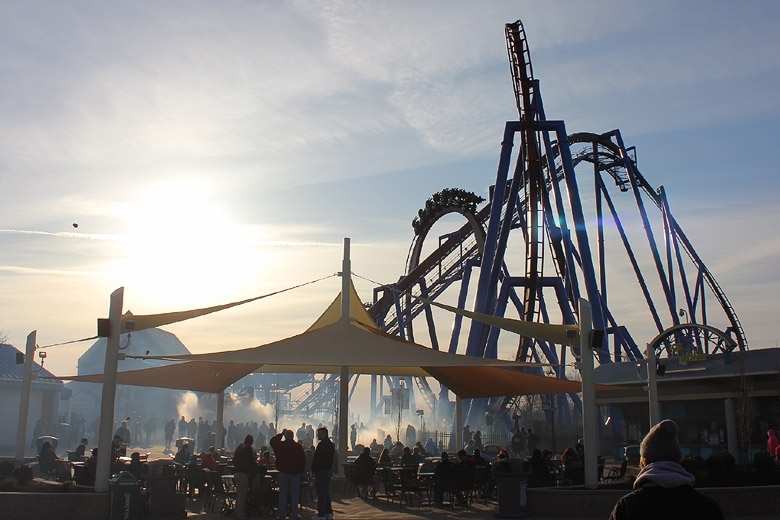 With the line swelling up fairly large at around 7:30 AM, I opted to break for breakfast, waiting in a line that was almost as long as Banshee's. 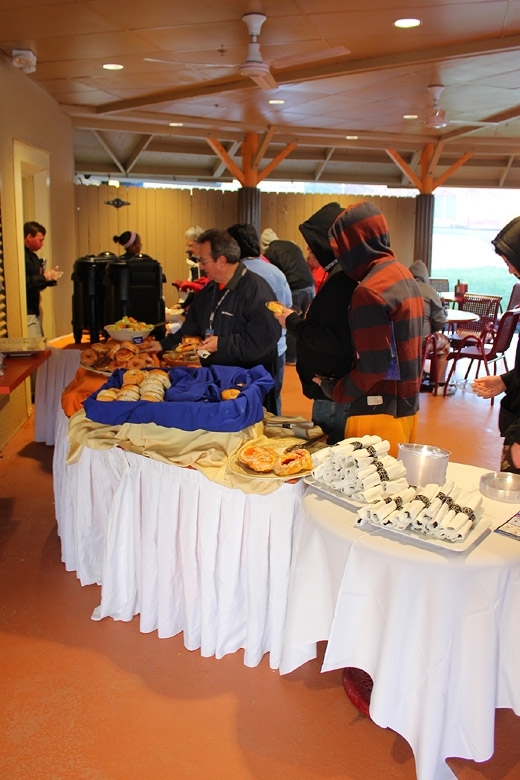 Our breakfast spread outside the Chicken Shack restaurant. I got there just as all the good donuts had disappeared! 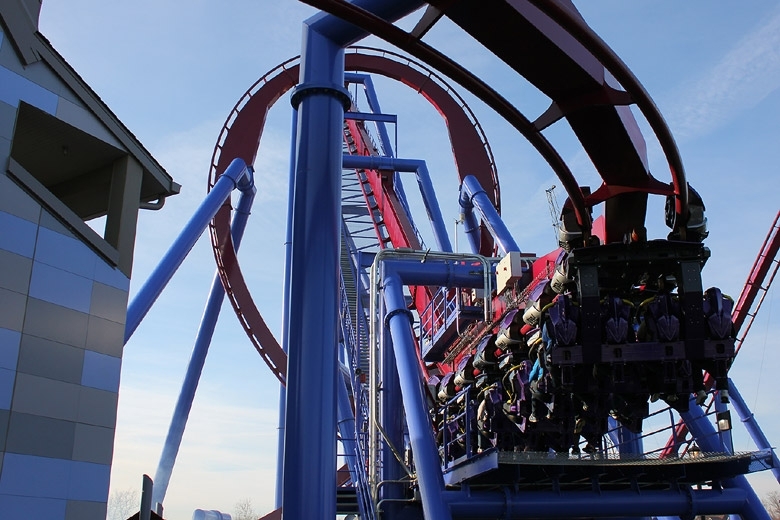 Hoping to let things warm up a bit, I also decided to wait to ride Banshee again until after the media day ceremony. While waiting, I was happy to meet up with a couple people I'd been on the Texas/Midwest trip with -- Doug, who's making some amusement park magic of his own, and Stacy, who is totally rooting for the wrong team in the NHL's metro division playoffs. Stacy is with me on the Banshee on-ride photo. 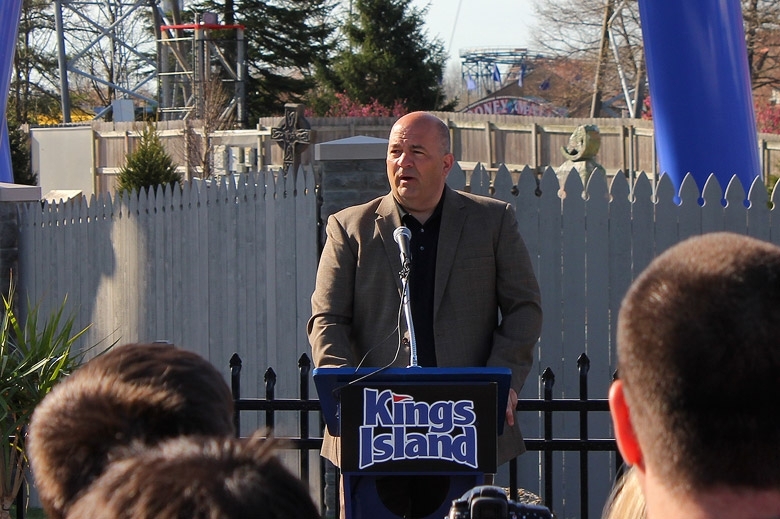 The opening ceremony got underway at about 9:45 AM, and our group heard from four individuals with plenty of good things to say about Kings Island and Banshee. 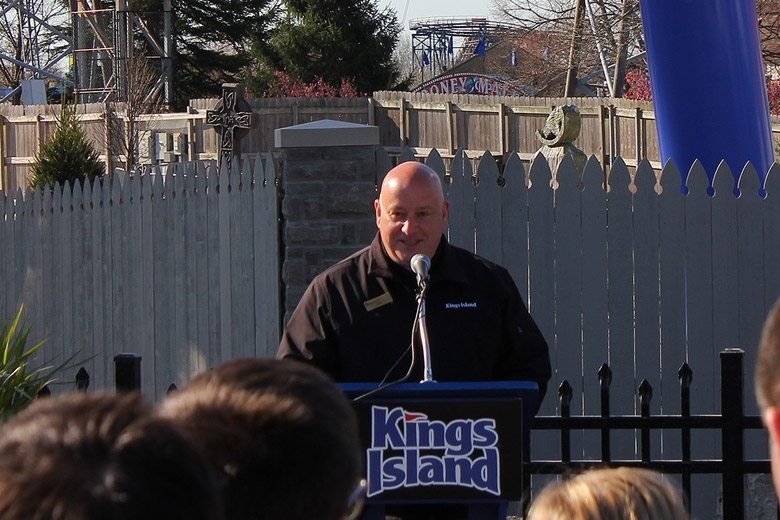 Don Helbig (Kings Island public relations manager) kicked things off, followed by Greg Scheid, the park's general manager. 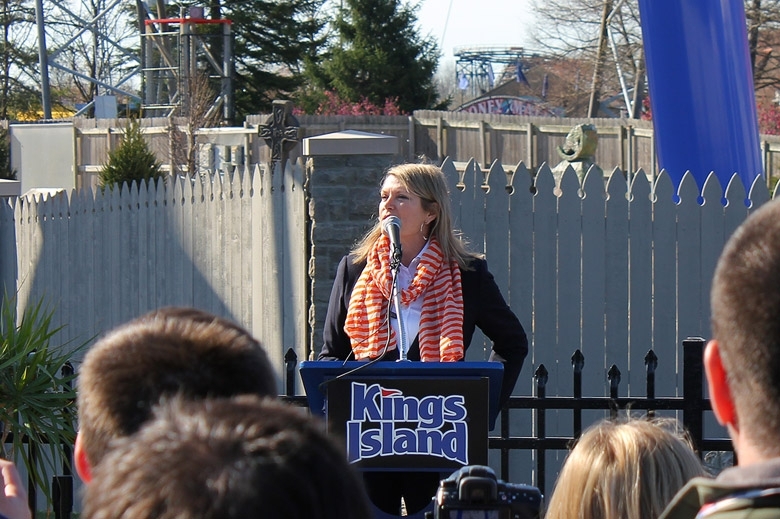 Rob Decker (Cedar Fair corporate vice president of planning and design) gave us insight into the coaster's construction, and Mary Cusick (director of TourismOhio) had some very positive remarks about Kings Island's contributions to the state as a major attraction. 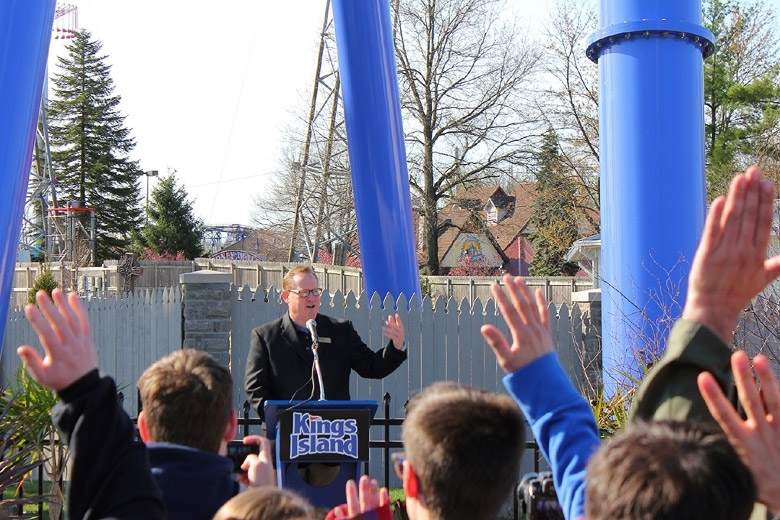 Don closed the ceremony by inviting us to ride one of four attractions for the rest of the day -- Banshee, The Bat, Delirium, and Xtreme Skyflyer (free of charge). 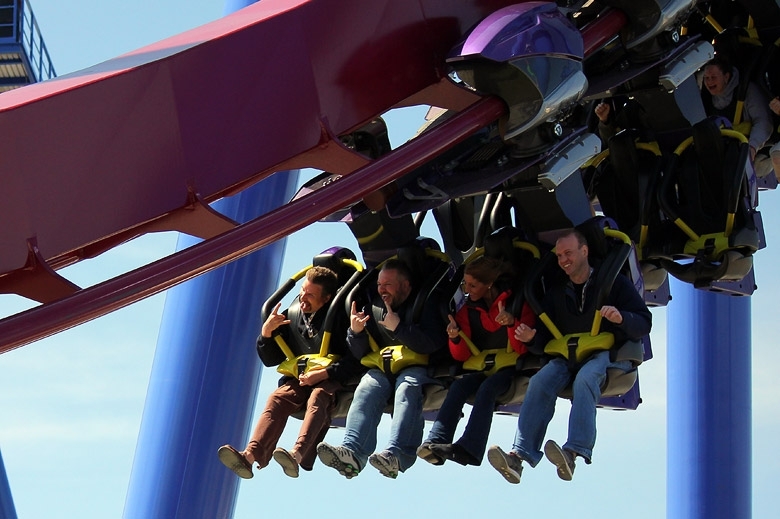 After that, the rest of the day was a mix of photography and Banshee rides, with some time for lunch and ice cream. 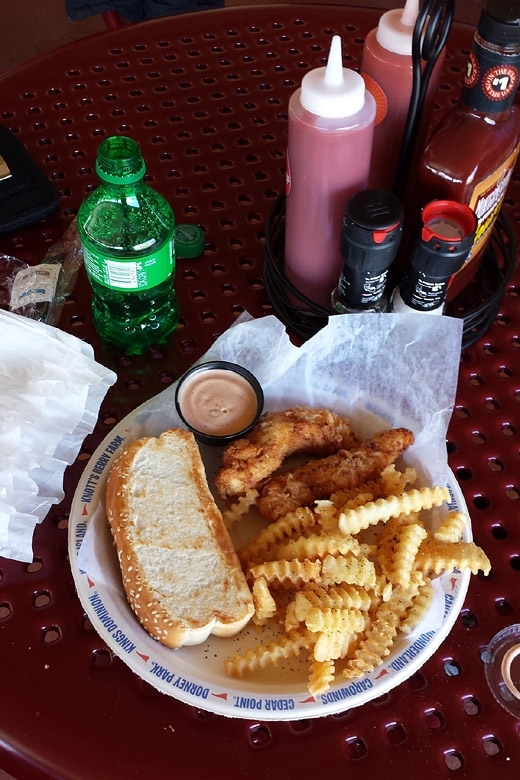 Lunch at the Chicken Shack was very similar to what you'd find at Raising Cane's. The chicken was pretty good, though I usually prefer mine a little crispier. The toast is a perfect example of taking a simple concept and doing it well. It's just bread -- it shouldn't be that good, but it was. 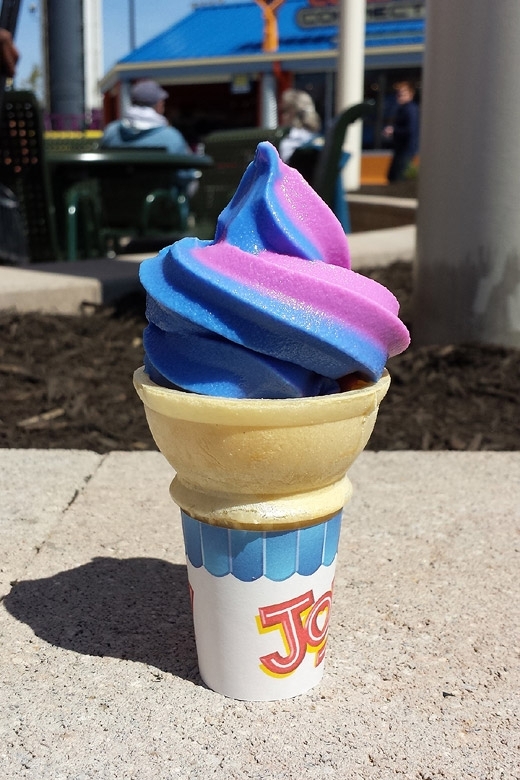 The Banshee Twist ice cream tasted, to me, like a mix of berry and bubble gum. Did I mention that breakfast, lunch, and ice cream were all completely free? 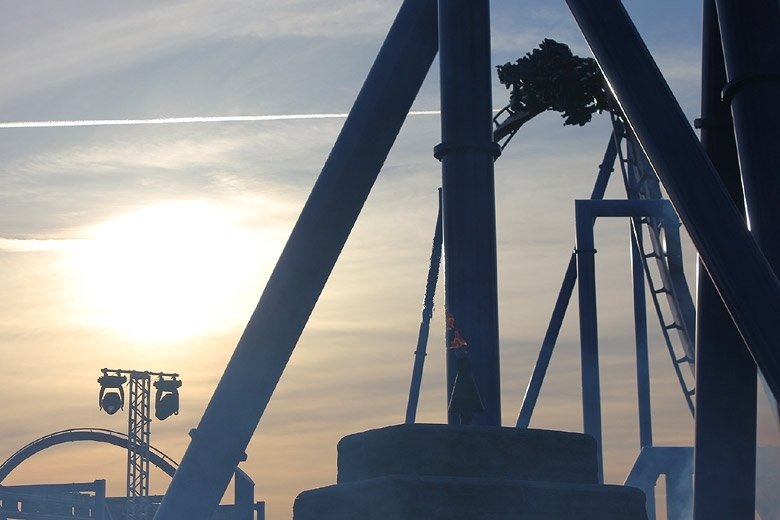 I also took one ride each on The Bat (which I'm finally ready to admit is better than Draggin' Iron, sans perhaps the misty finale over the pond) and Delirium (which I was probably wise to only ride once on an out-of-practice stomach). 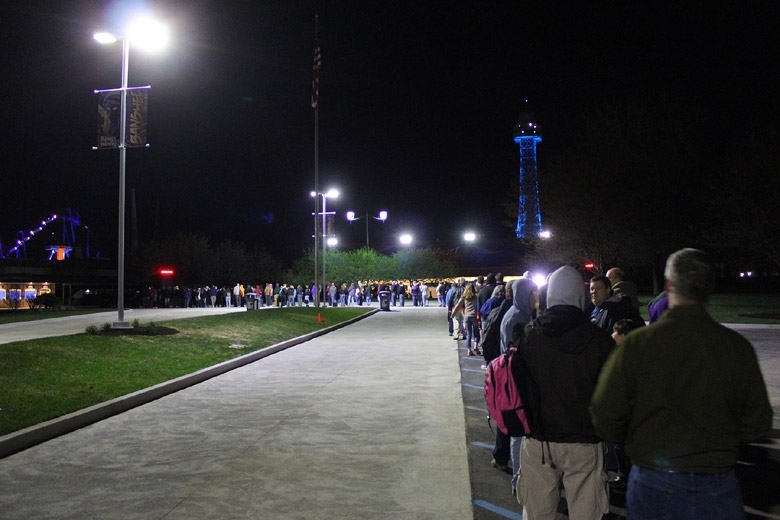 Banshee's line generally hovered between 15-30 minutes after the opening ceremony, but there were times when it got as short as 10 minutes. 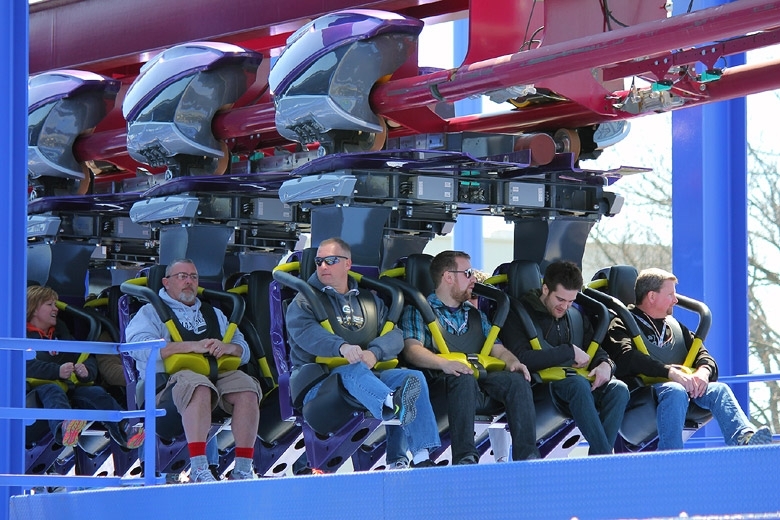 Despite a couple attempts, I wasn't able to get a ride on the front seat -- there was a limited amount of room on the station for row 1 waits, and the ride operators understandably wanted to keep things moving. As it turns out, most of the media work ended up occurring in row 2, with a camera rig (including some extremely bright LED lights) set up on the back side of row 1. 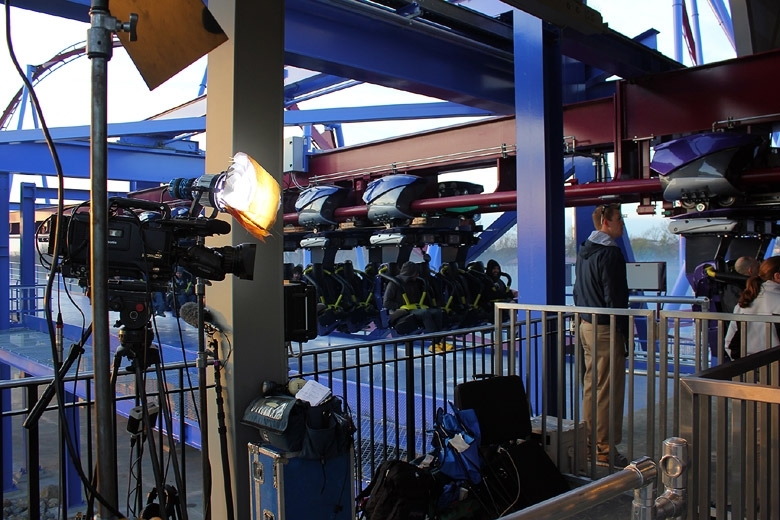 In fact, I didn't see much in the way of working media on the ride during the second half of the day. As the crew got better and better with dispatches, the waits moved much quicker later in the event. In fact, I got three rides in about 35 minutes to close out the day -- including a row 2 run on the final train of the afternoon! 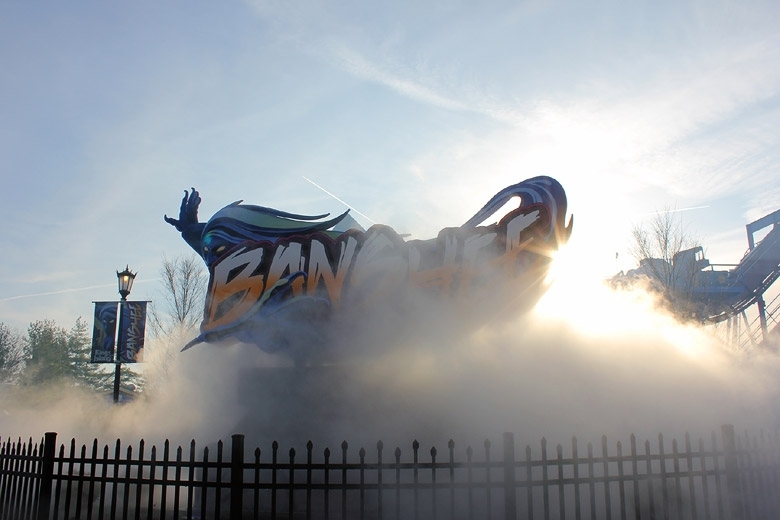 Banshee is a fantastic ride, and really exceeded my expectations. 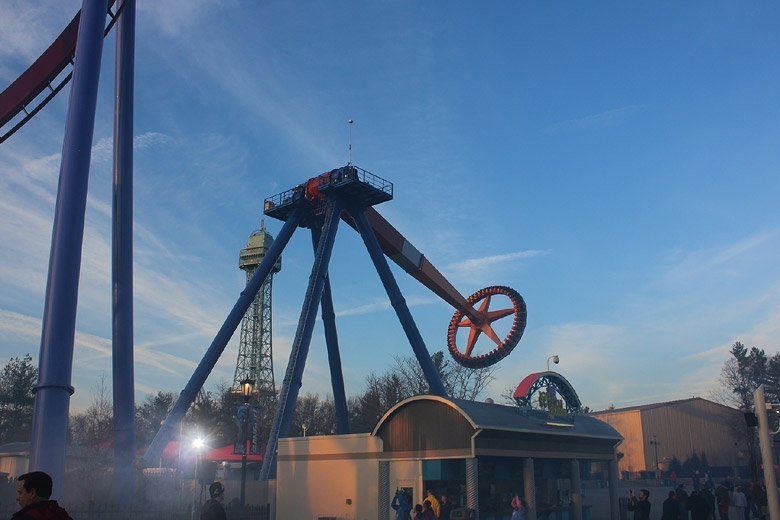 My first ride was actually my least favorite, and not just because of how cold I was. I really feel like the ride picked up speed as the day went on, with temperatures increasing by about 30 degrees from 7 AM to 2 PM. My most intense rides were in the late morning and afternoon. 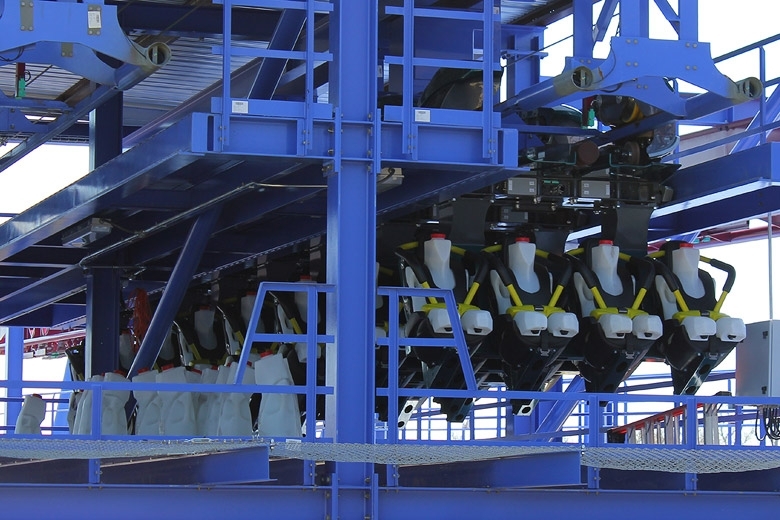 Banshee's features are fairly large, and it probably needs to be running at top speed to keep up the intensity. Once it got going, that intensity was surprising! 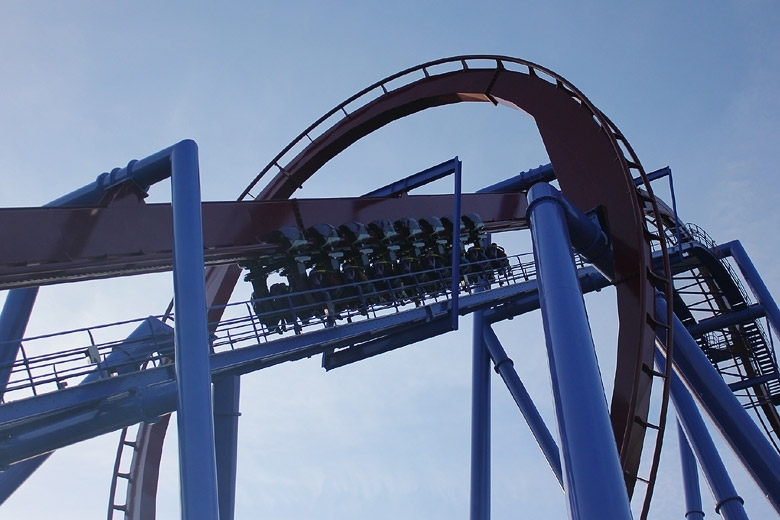 Banshee definitely makes good use of the terrain it's built on, picking up speed between inversions, and providing the ride's most interesting element -- the drop into the ravine out of the zero-g roll. 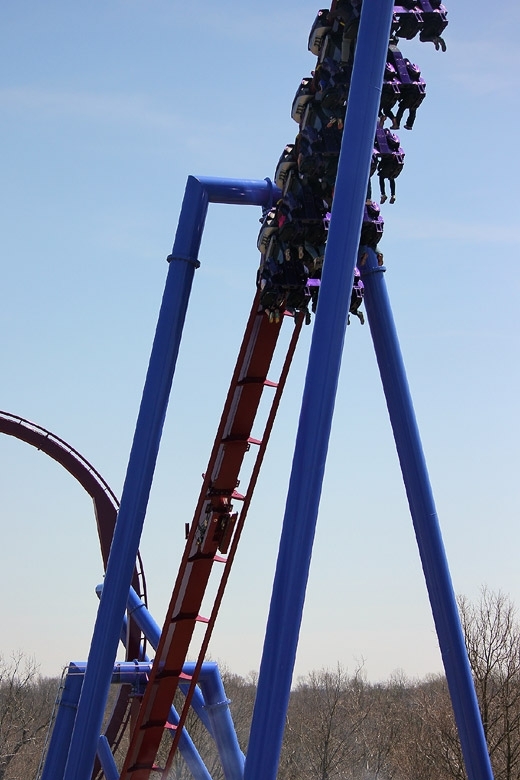 That was my favorite part of the ride, with a well-paced twist that feels pleasantly floaty, transitioning into a big drop (which comes with air near the back of the train). 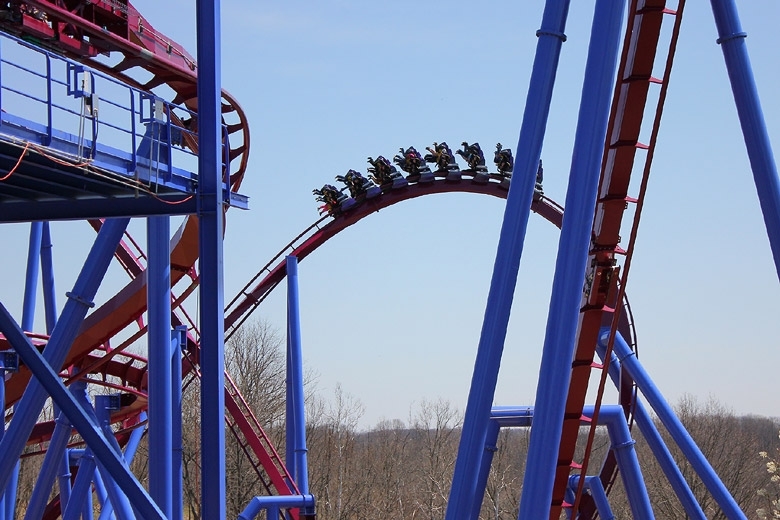 Banshee's forces are definitely different from front-to-back, which makes it worth riding several times in several places. The transitions aren't especially snappy, since they're so large, but the speed still allows them to be forceful. 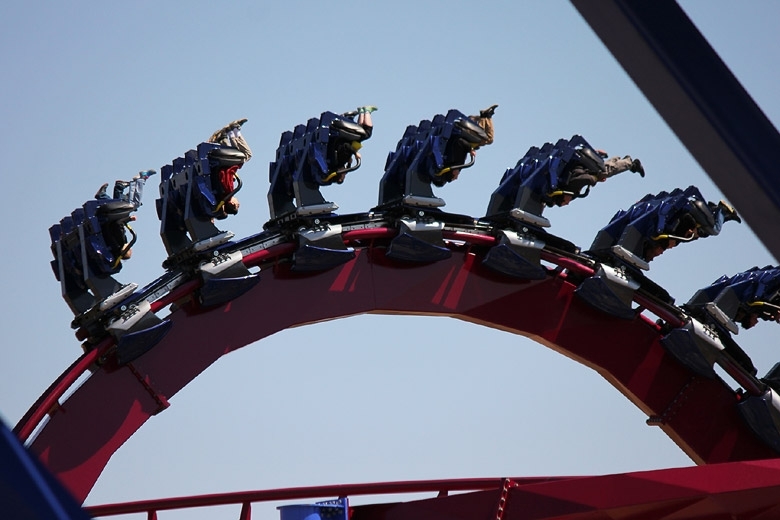 However, the back of the train does provide some snap, especially on the first drop and coming out of the zero-g roll. 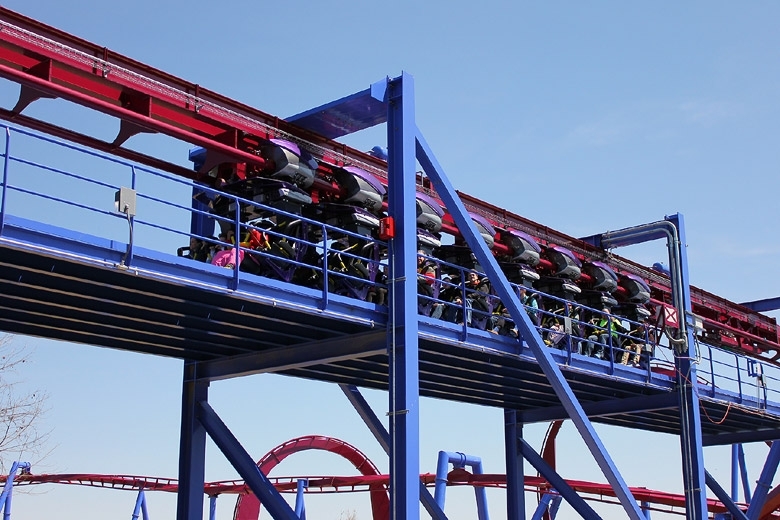 The ride's strongest force might actually be in the front row, coming out of the second vertical loop and into a right turn -- it hits the tight curve with a lot of speed. 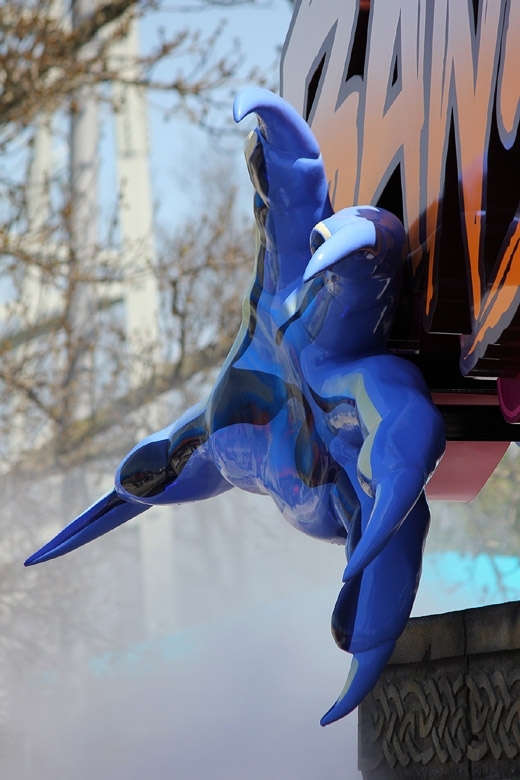 The high (and slow) points of the two halves of the batwing / pretzel element were the only parts that I thought felt a little too drawn out, but the sense of speed in the valley between the two makes up for it. I'm indifferent about the inline twist at the end -- it's a neat sensation and it's fun, but it's paced strangely compared to the rest of the course. 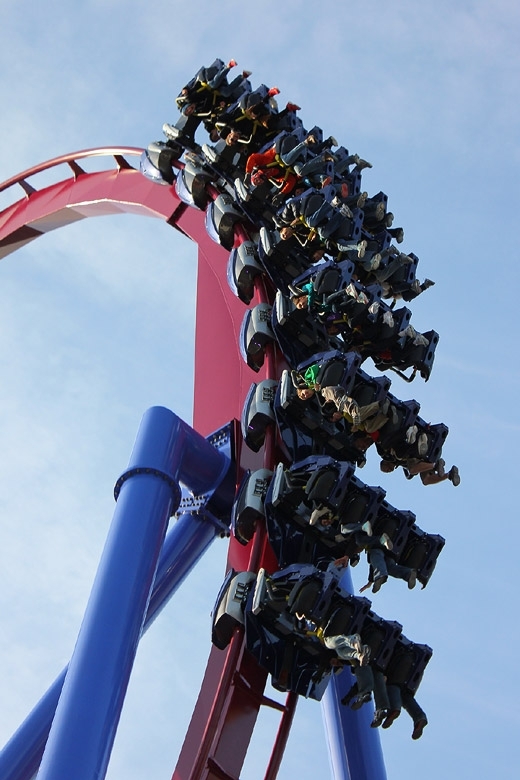 Thankfully, the final spin before the brake run provides some final thrills before the end of the ride. 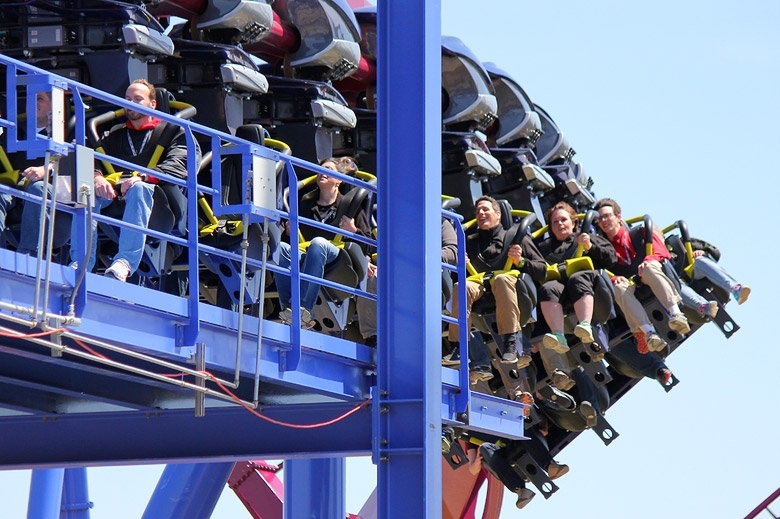 Banshee earns its title as the world's longest invert -- the ride lasts a while, and covers as much ground as you'd want to have covered from one cycle. The pacing is great, and the order of elements is nearly perfect. 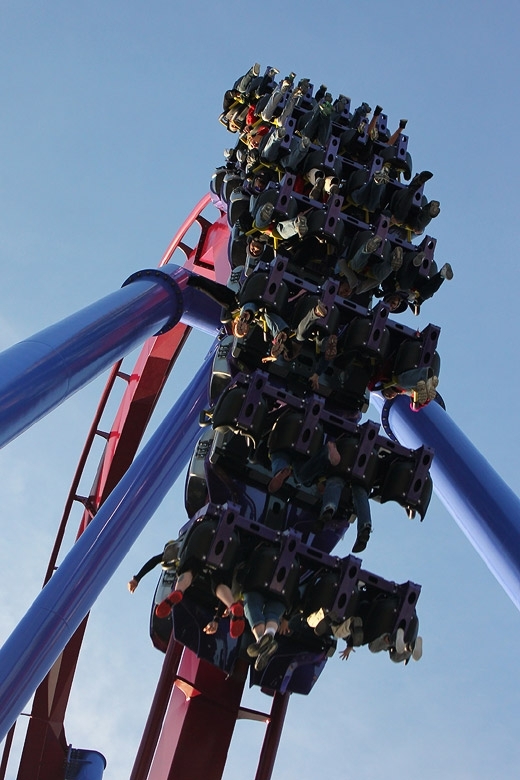 I'm actually really happy that the ride doesn't have a cobra roll or a corkscrew -- those are my two least-favorite elements on inverted coasters. 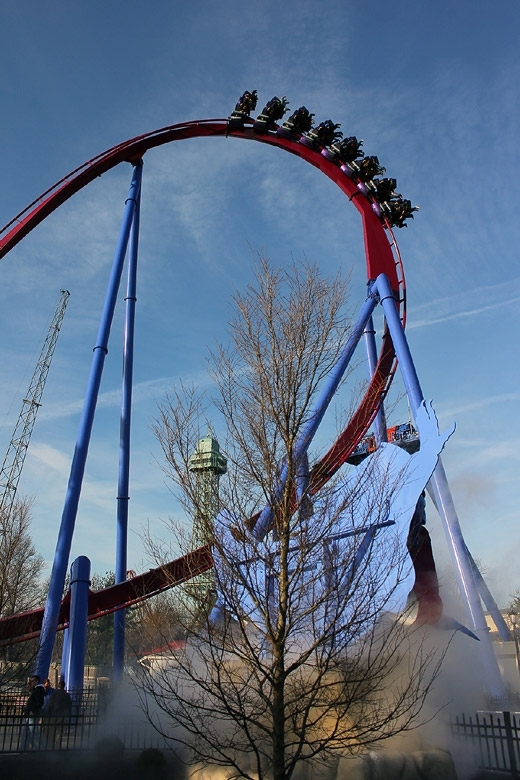 I'll close my review of the ride with the ride's beginning -- the first drop is the best on any inverted coaster I've been on. It's incredibly steep, with no pre-drop, and provides the stomach-in-throat feeling every time. 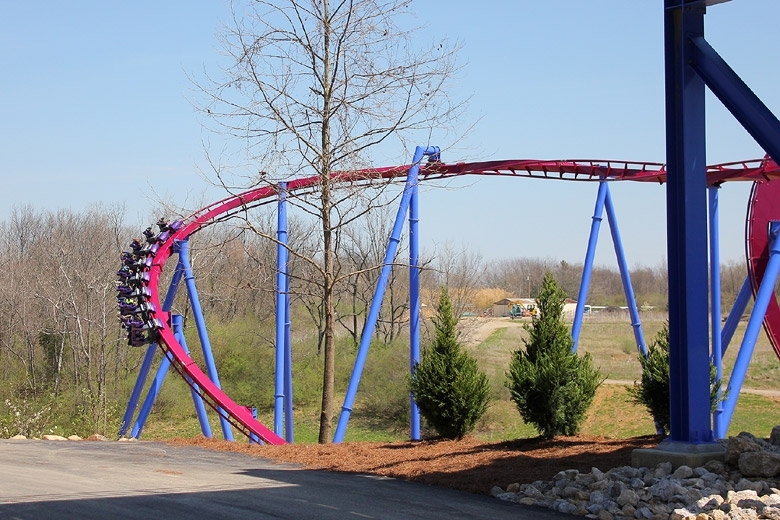 To get the Ohio-based comparison out of the way, I think Banshee is easily better than Raptor, a coaster I'm very fond of. 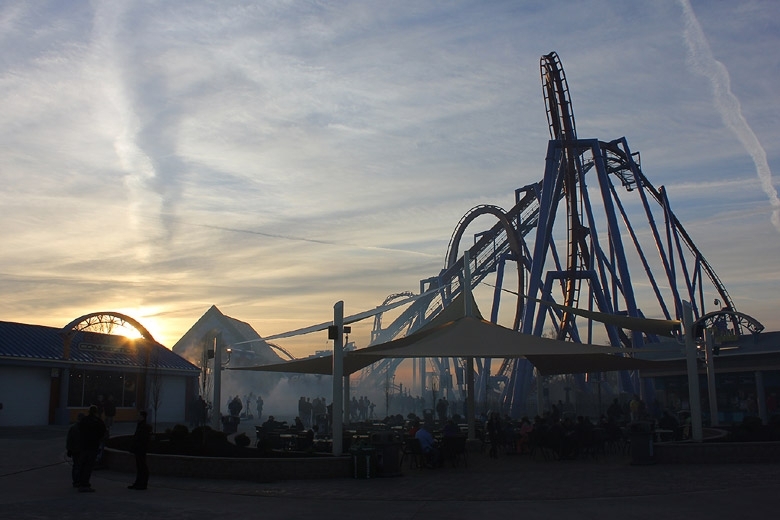 My highest-ranked invert has always been Montu, and though I haven't been on it in three years, it has some nostalgic appeal to me that might skew its place in the standings. Banshee is, at least, right with Montu on my list of favorites. 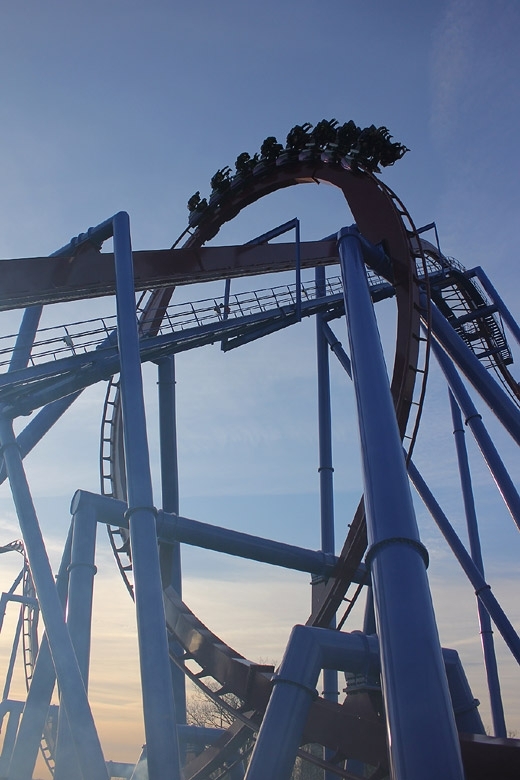 That's going to put it in my top 10 for all steel coasters. 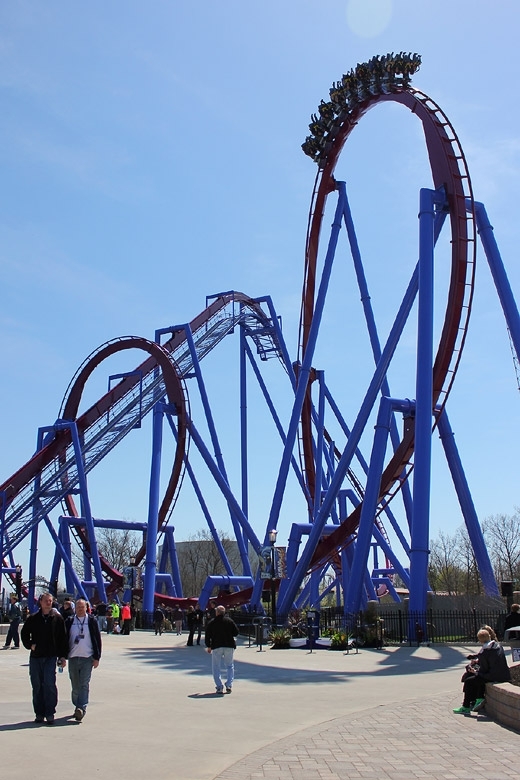 I drive past Kings Island once a week on I-71, and as I watched Banshee rise above the ground, my anticipation was muted. 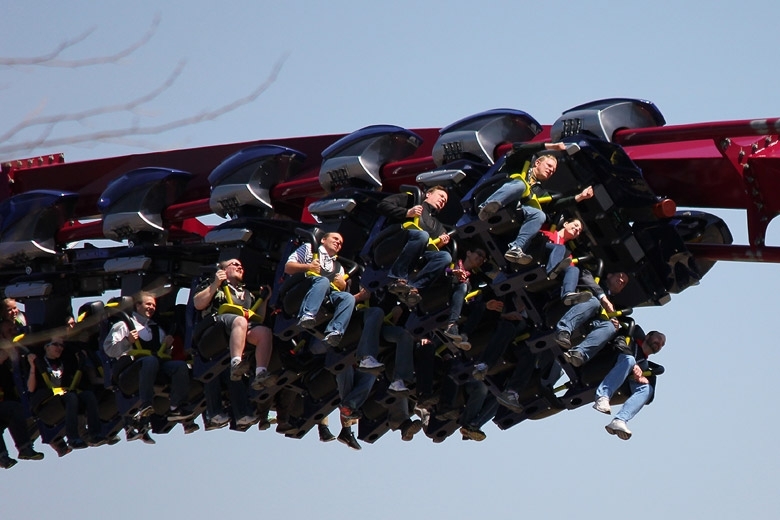 I knew the reservations that the enthusiast community had about the ride, and I agreed with several of them. 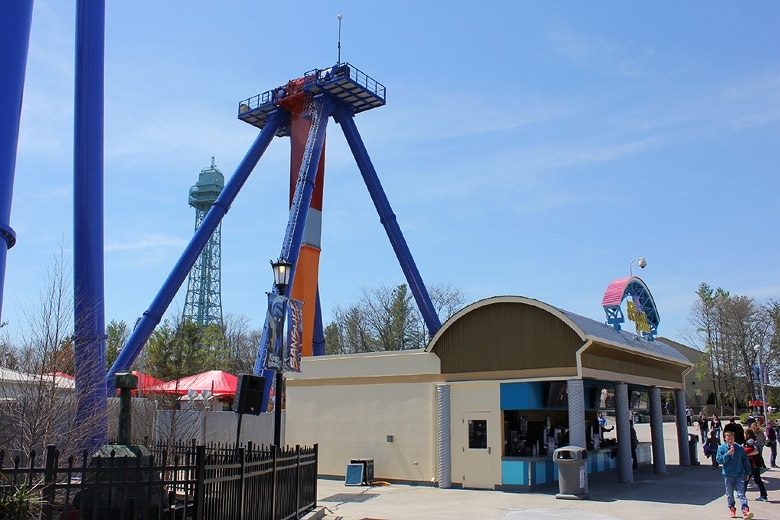 Read some posts from the Kings Island topic here if you want to revisit them -- or, better yet, save your sanity and don't. 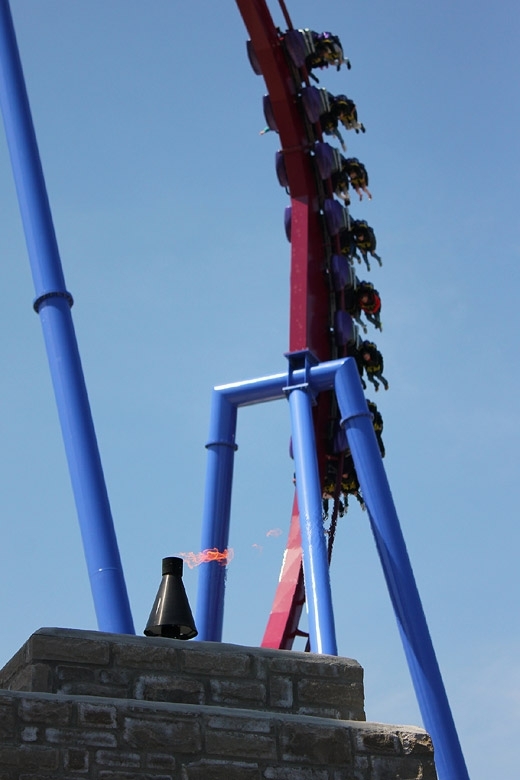 I thought it'd be a very good coaster, but not a great one. I thought the restraints would leave me sore, unable to ride more than a couple times. 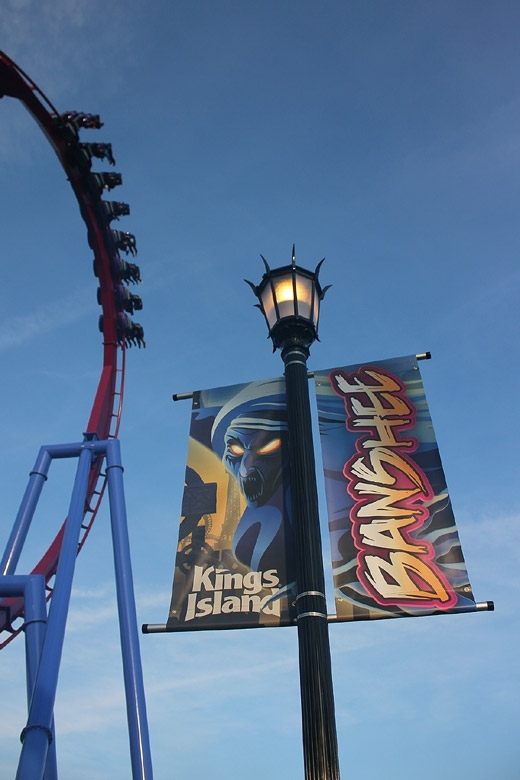 I didn't think Banshee would rise above its mix of elements to become a full circuit of intensity and fun. I was wrong. 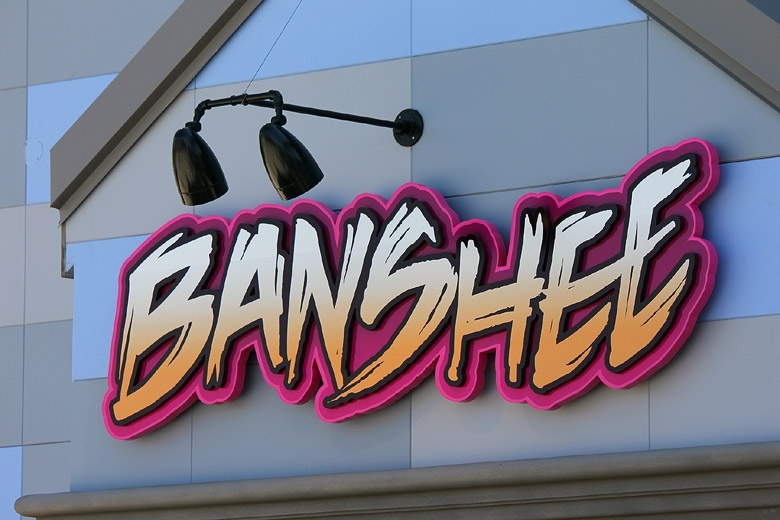 Banshee is all of the above -- a great package of theming, force, length, and comfort. 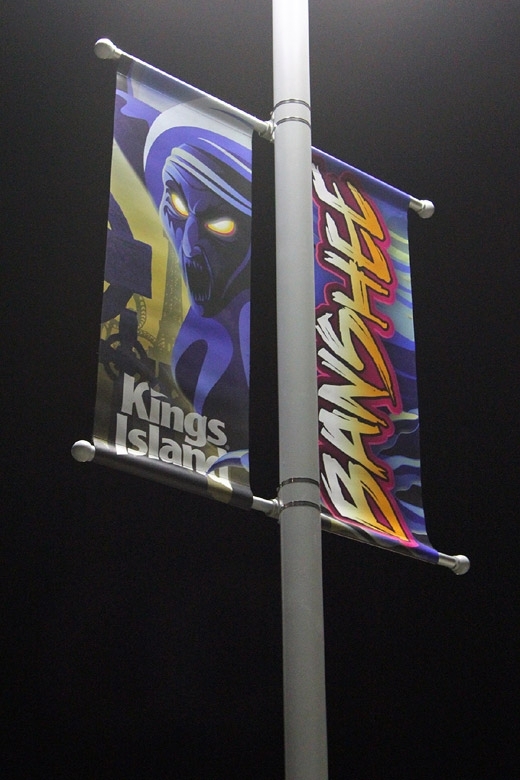 B&M and Kings Island did a great job on Banshee, and Kings Island especially did a great job on the media day. 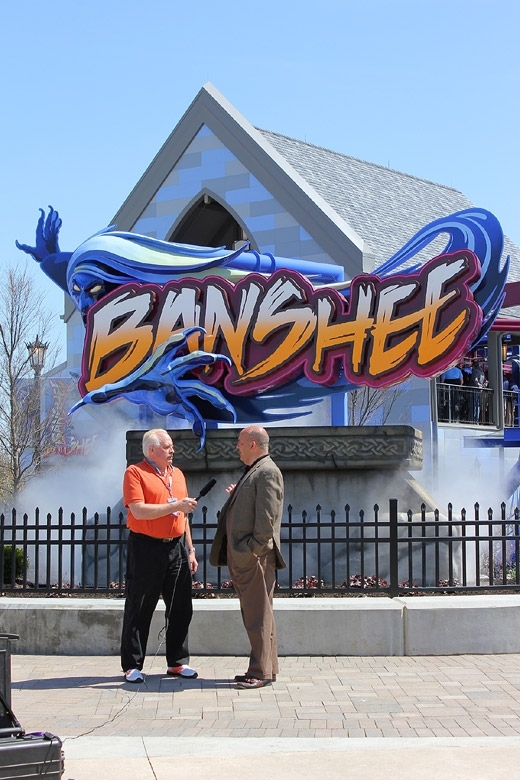 My sincere thanks goes to Don and Greg and their staff, though I know they don't need it specifically -- Banshee's universally-positive reception is the best gratitude that Kings Island could ask for. Last edited by The Great Zo on Tue Apr 22, 2014 11:27 pm. My spot in line as of just after 5:00 AM. It did take a little while to get into the park. 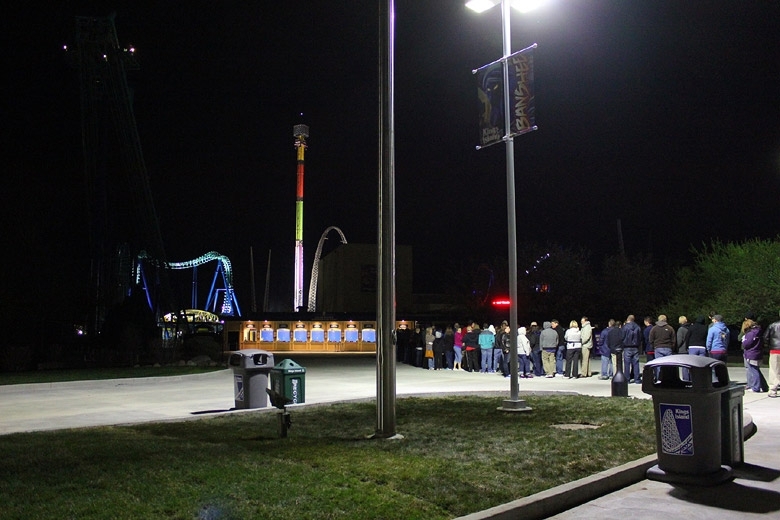 If you squint really hard, you can pretend all these people are in line to ride a Vekoma at 5 in the morning. This is the line behind me -- twice as long as what's in front of me! Now, why are we all here again? Finally made it into the park! Nice to see the tower all lit up. 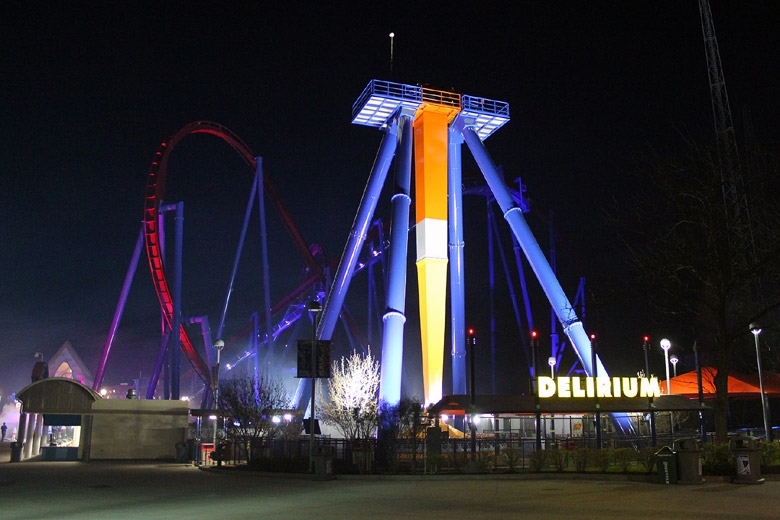 Delirium was sporting a brand new paint job, and what's that behind it? 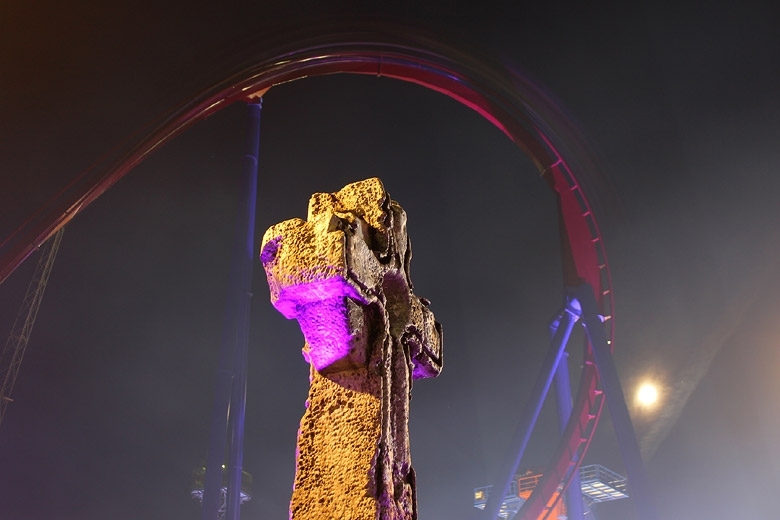 One of the most nighttime-photogenic coasters I've ever seen. 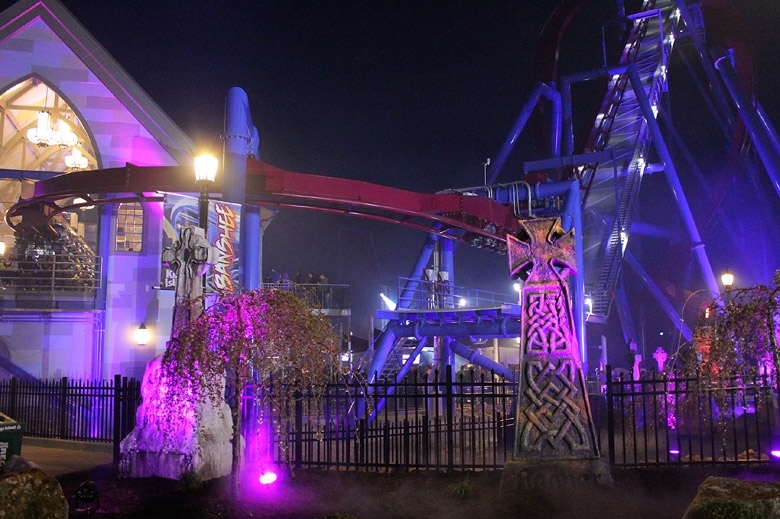 Banshee's station looks spectacular, with blue, purple, and red lighting effects. 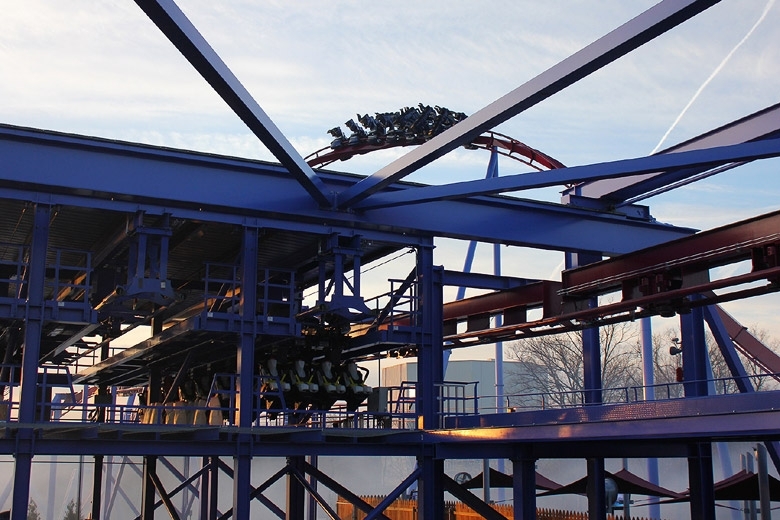 An early train leaves the station for a "night" (or early morning) ride on Banshee. 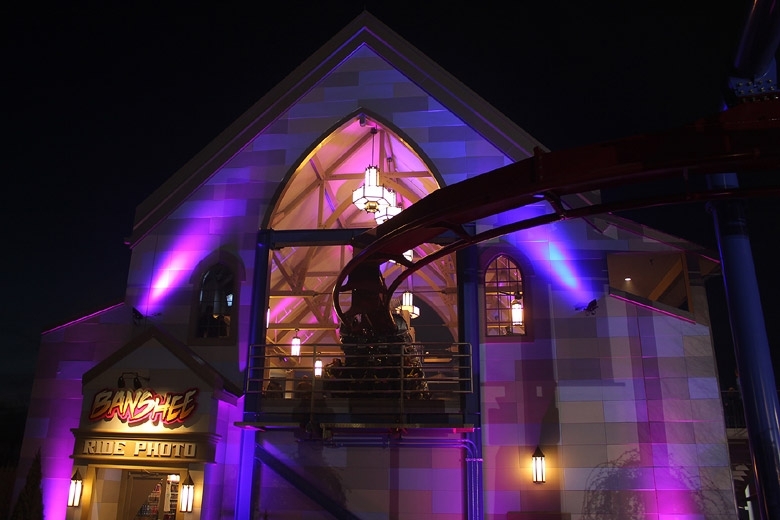 Heading out over the graveyard to the lift hill. 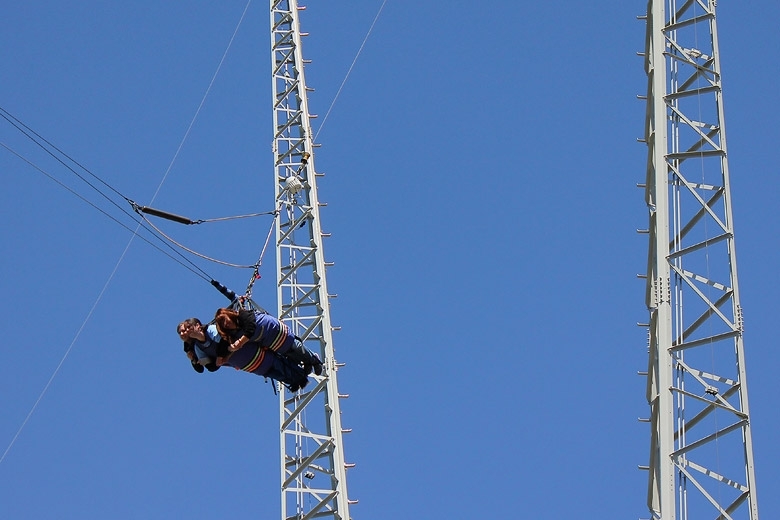 Climb the lift and listen to the theme music. 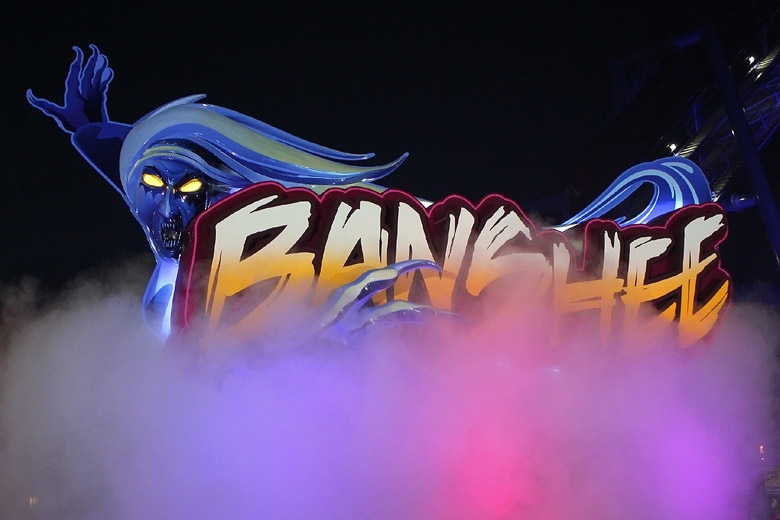 Yes, Banshee has its own theme music. 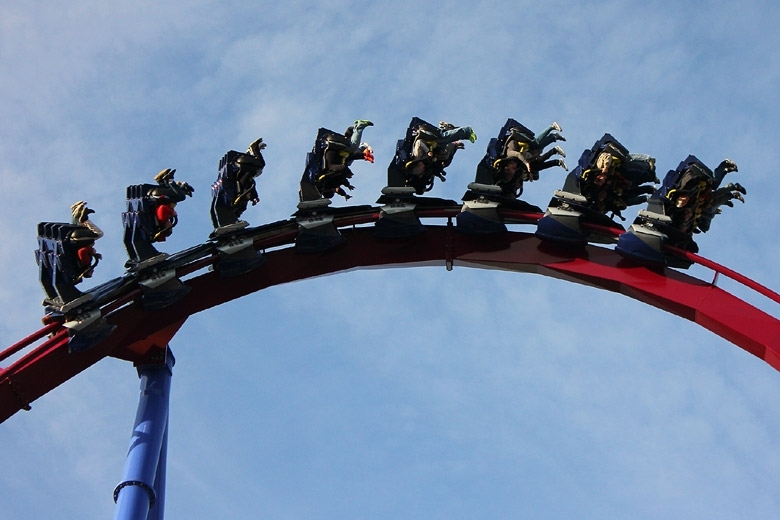 Flying through the ride's first dive loop. Dive loop over a gravestone. It's really weird to /start/ a photo set with night shots like this. 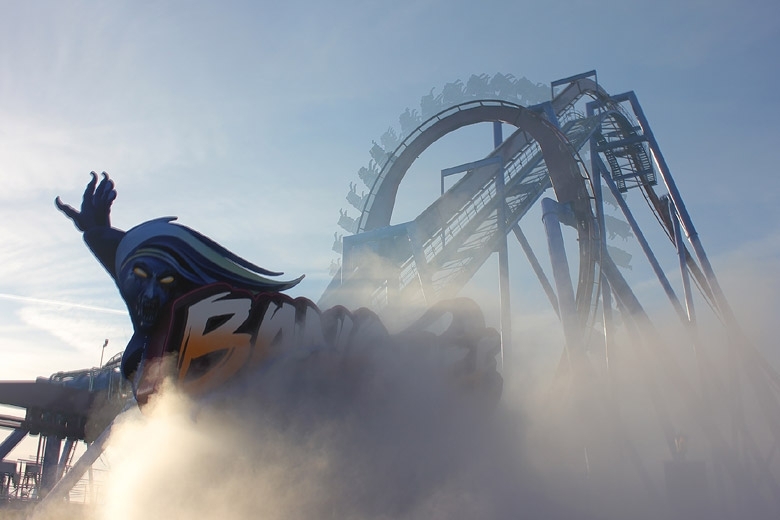 Fog effects filled the midway near Banshee, which looked absolutely fantastic. 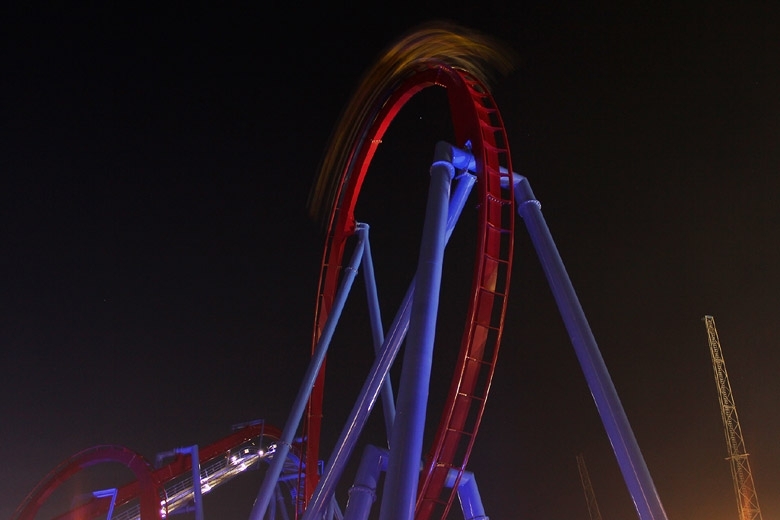 I would have loved to spend more time taking pictures in the dark, but I had to get on the ride! 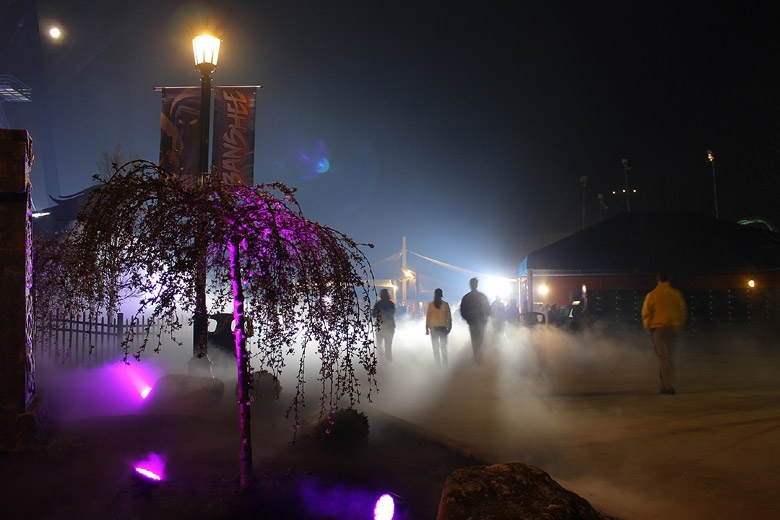 Most of the fog emanated from under the Banshee sign, but there were other sources in and near the queue. Robb goes live on-air with a Cincinnati TV weather guy. 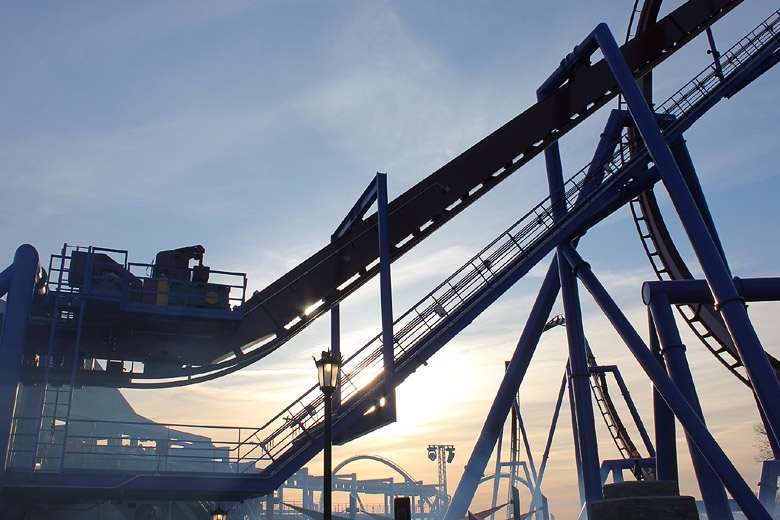 This one was taken from the steps leading to the ride platform, just minutes before my first ride. That mist you see under the track is natural -- very common in valleys on cold early-spring mornings near sunrise. After my first ride, I had to get some pictures as the sun came up. 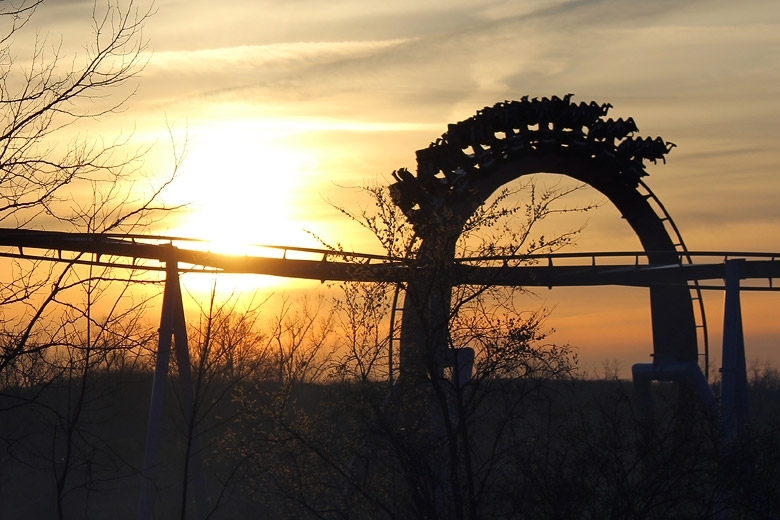 The second vertical loop and the sun. Inline twisting past the sunrise. Waiting on the brake run. 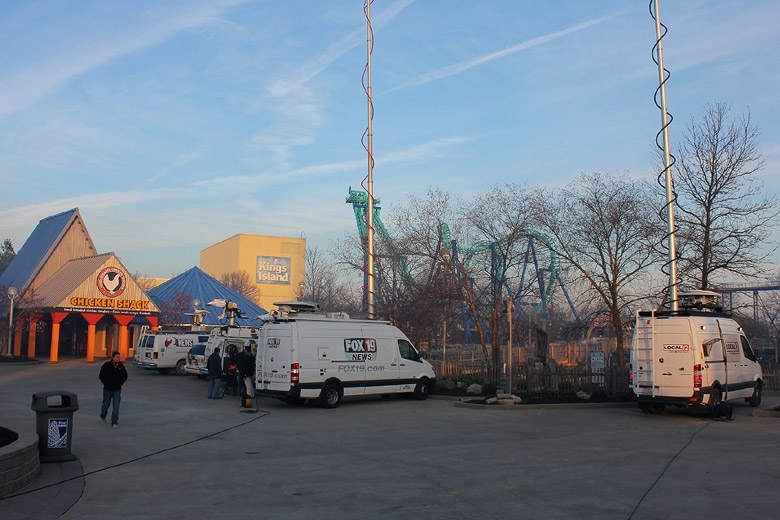 During the morning, the station was filled with cameras and TV equipment. 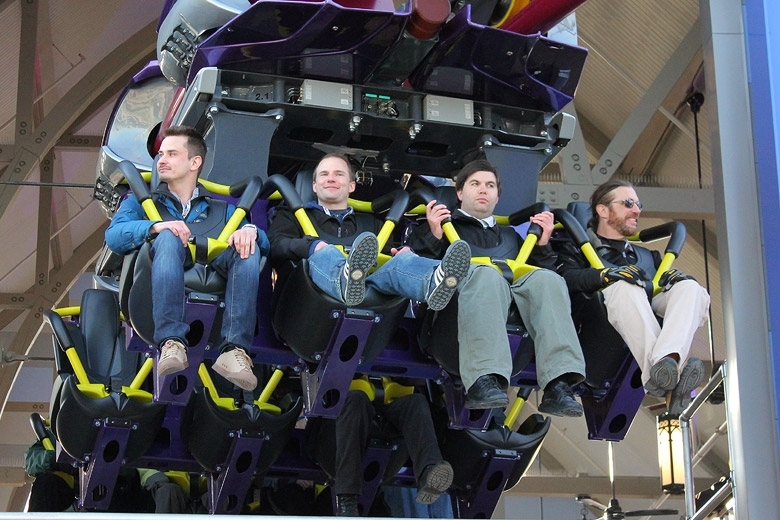 Media day was built around getting good footage of the ride, including footage /on/ the ride. As the park also released their official POV video, any moronic desire to film unauthorized should be squashed -- lest you end up on Twitter, whining about getting fired, calling yourself an idiot, and begging for money. True story. Here's a good view of the trains. 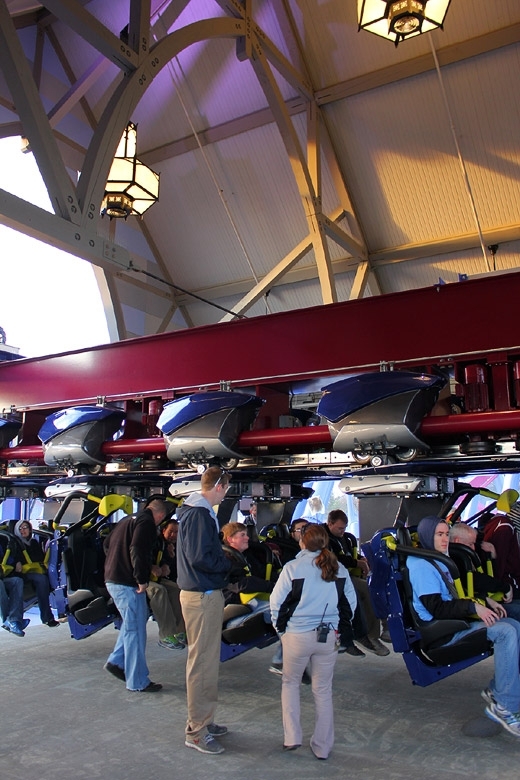 The two-column format makes them much more open for viewing than the older B&M invert trains, and the restraints are very nice. 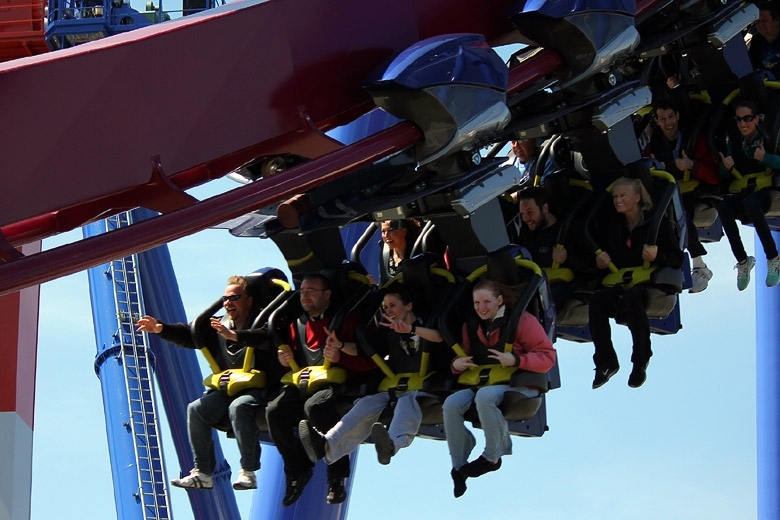 For someone thin like me, there is some minor discomfort that comes from the vest contacting the collarbone at all times, but any "locking" issues (as on Gatekeeper) are a thing of the past. The new style is worth it simply for the fact that there isn't a standard OTS restraint to headbang against. 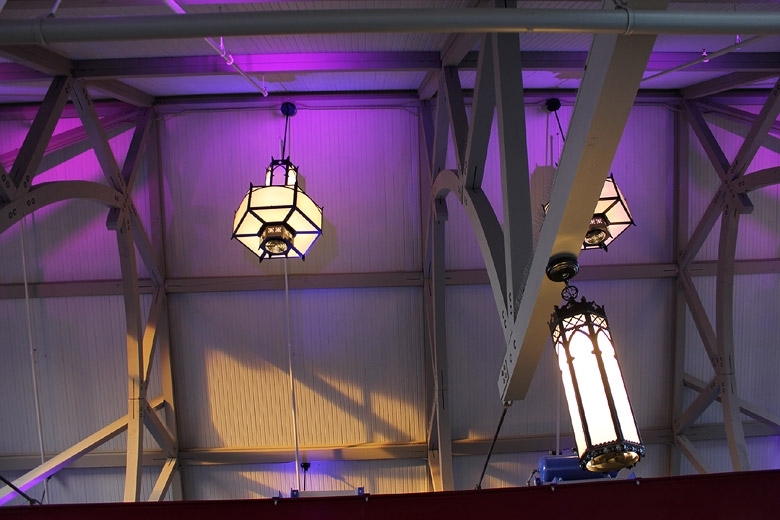 The station ceiling is also done up in nice lighting. KI staff checks the trains for dispatch. 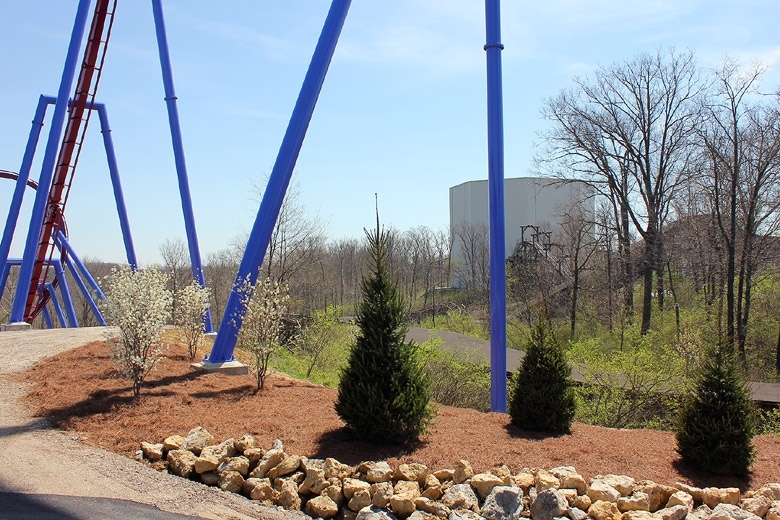 A look over the reconstructed area near the north end of the park. 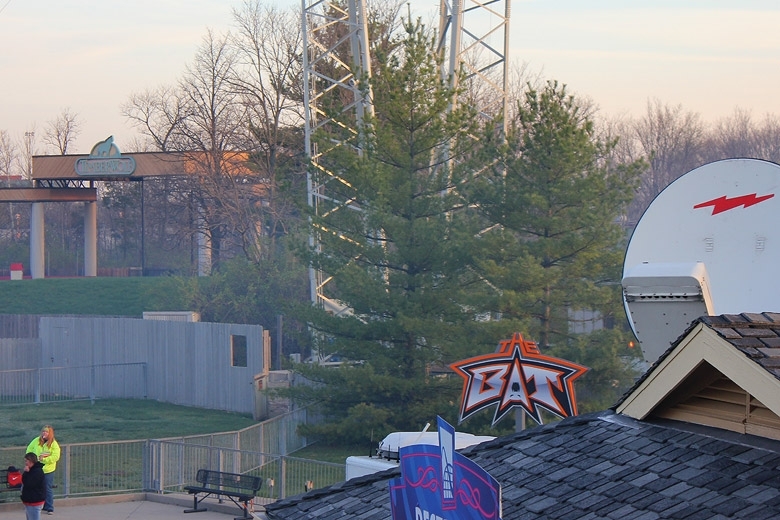 The entrance to The Bat, which is near the Timberwolf amphitheater, and right next to a huge satellite dish. 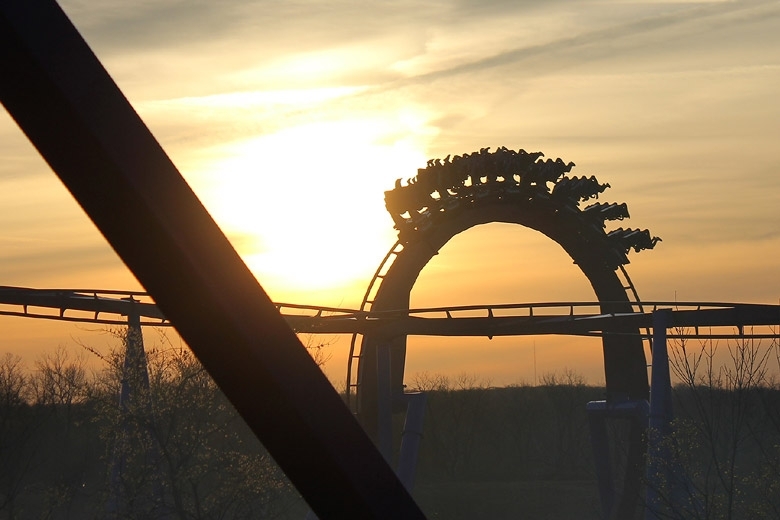 One more sunrise shot, with Banshee screaming through the second vertical loop. 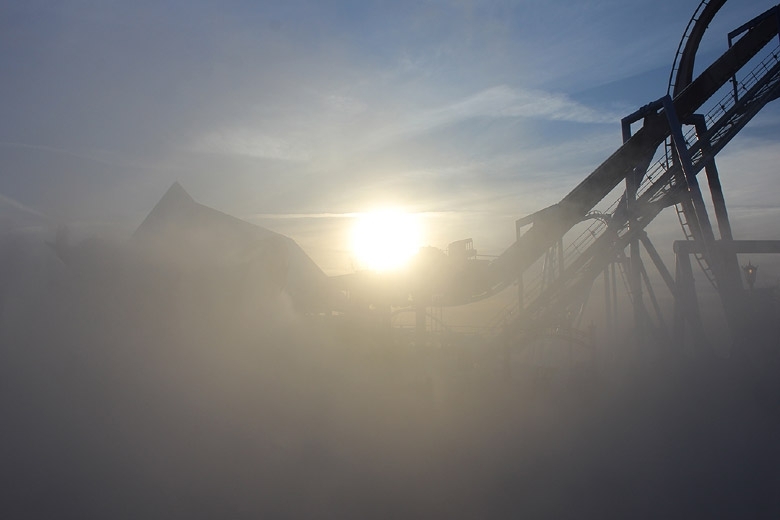 Delirium begins testing in the early-morning mist -- a precursor to its opening for operation later in the morning. The local media -- especially Cincinnati and Dayton media -- was well represented! 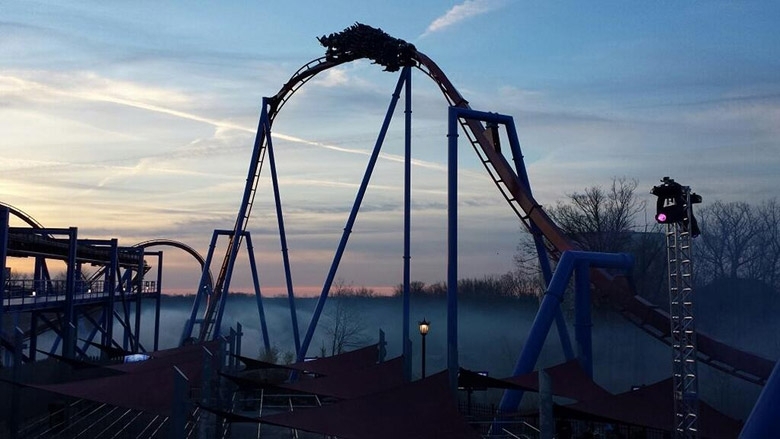 Sunrise over Banshee on a very chilly morning. The ride's sign is in here somewhere -- can you find it? 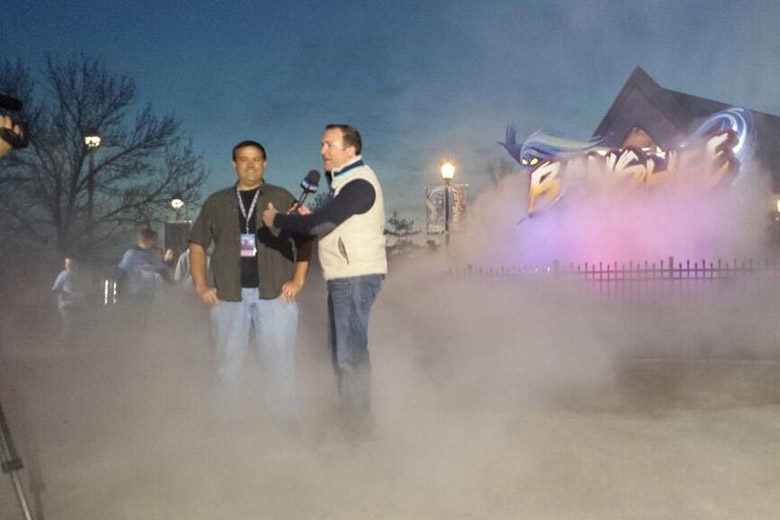 Mist in the queue, which does have a permanent installation for FastLane Plus. It was being used on Media Day by the pink taggers. 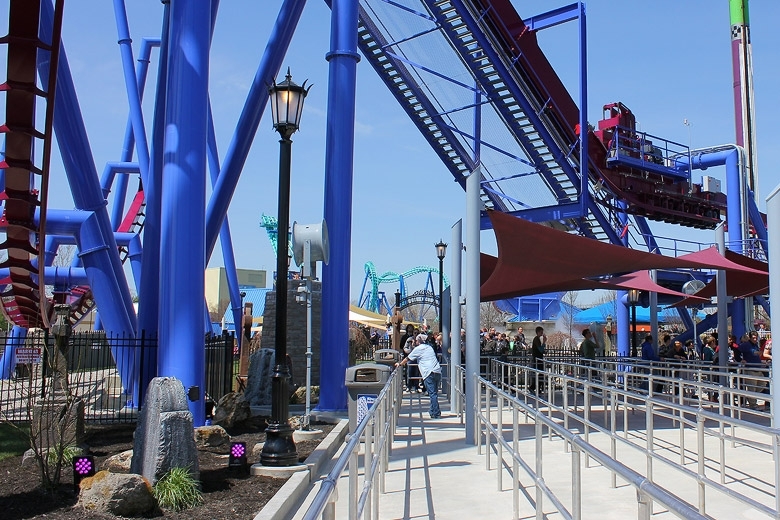 A look at the lower part of the lift hill. 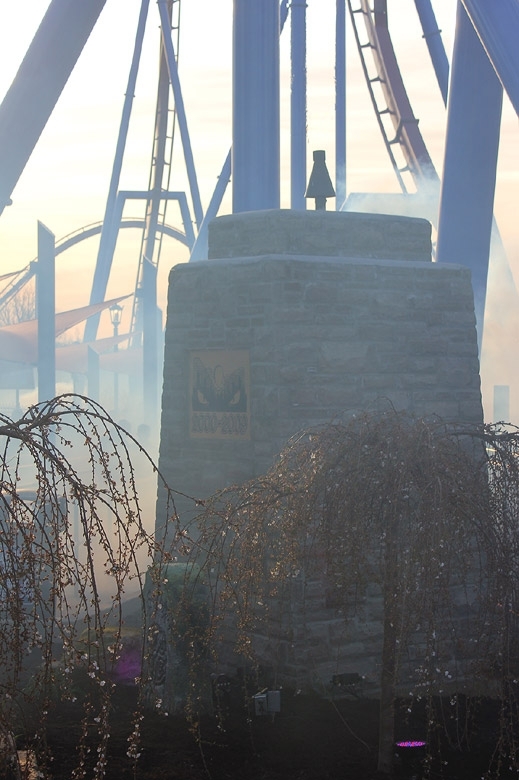 Mist over the Son of Beast memorial. More on that later in the post. 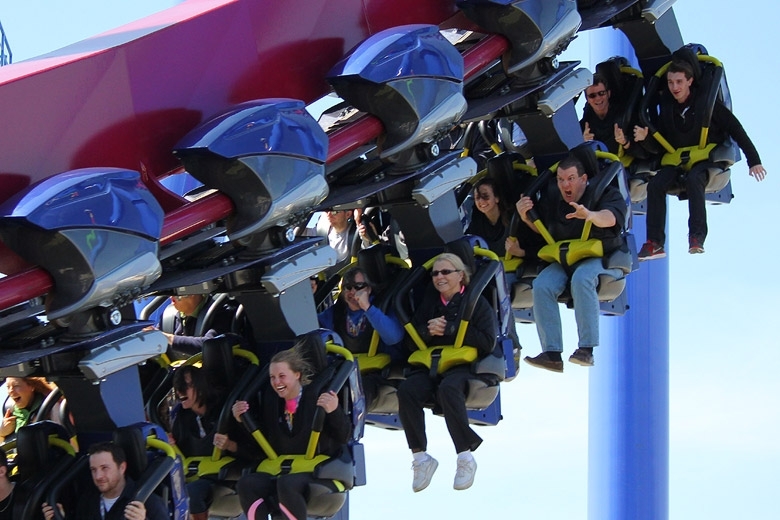 Threading the needle on the lift hill. This lift hill was pretty quick, and the chain was very quiet. Even still, it was just slightly too loud to hear the theme music very well. You could actually hear the music better from the queue. Banners like this were all over the place. 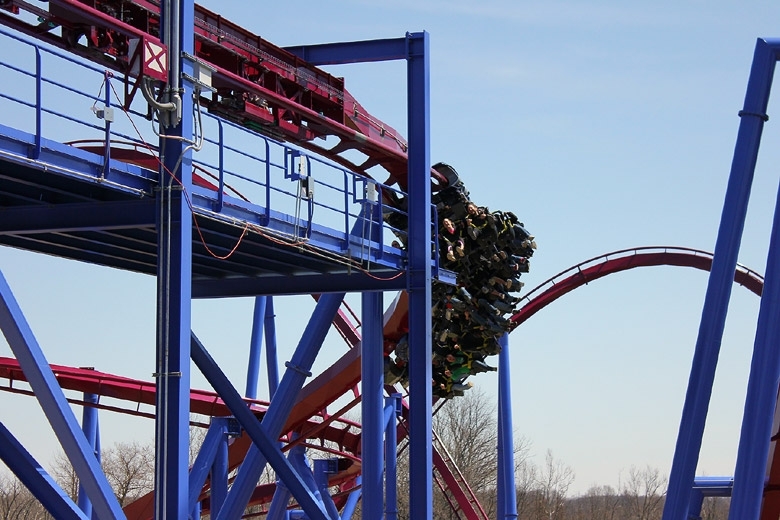 Looping over the lift hill! Diving through the zero-g roll and into the misty ravine. 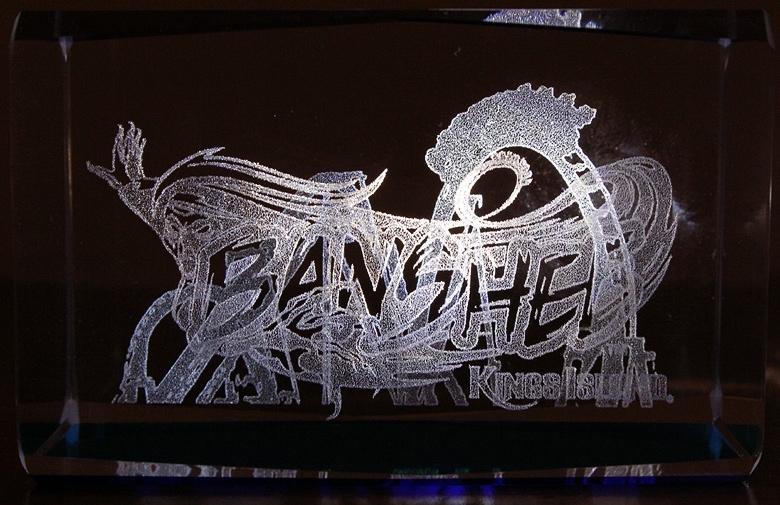 Part of Banshee's awesome lighting. As the sun rose higher, we kept waiting for it to warm up, and it did -- eventually. 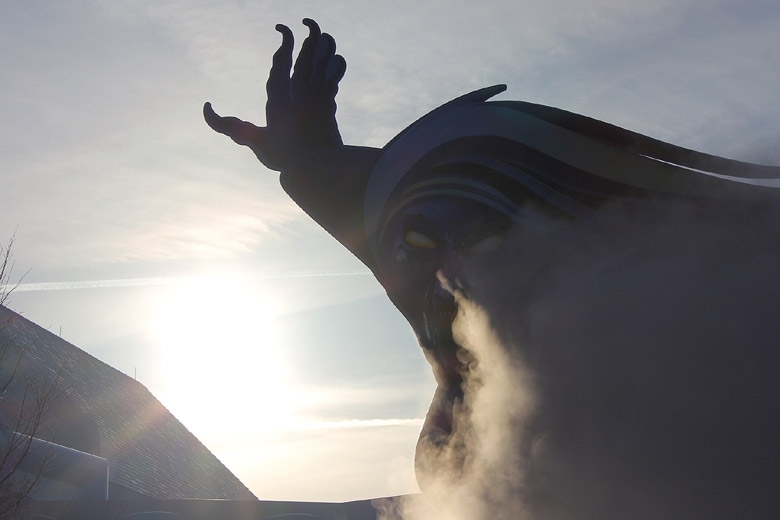 The low angle of the early morning sun did provide for some unusual photo ops that might never exist again! Lots and lots of feet. You want fog? They got fog. This is Eve. Say hi to Eve. 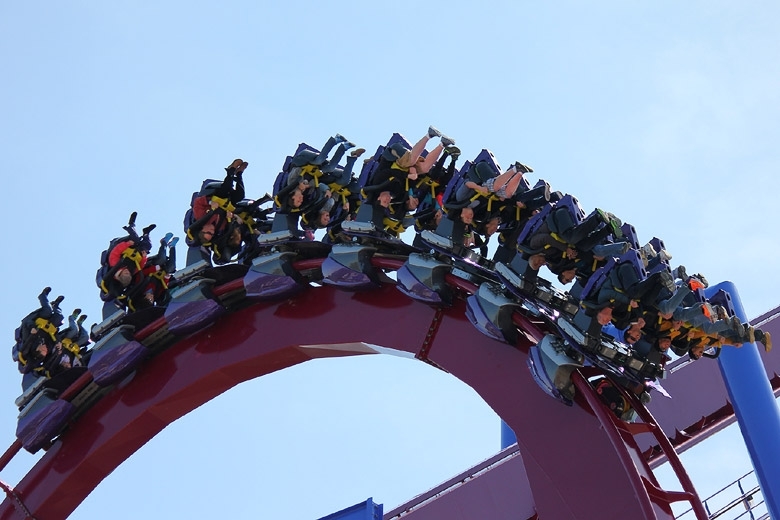 This angle is destined to become one of the classic shots of Banshee in action. 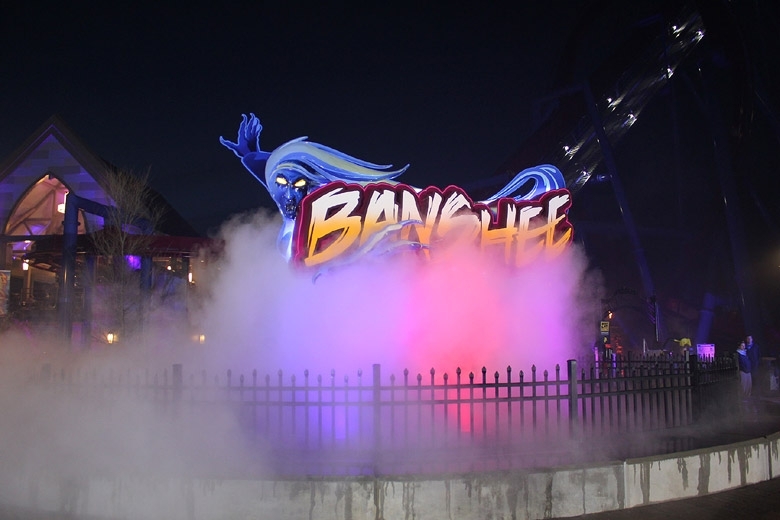 A view of the dive loop and the back side of the Banshee sign. A side view of the spacious trains. The front row is ready to ride. 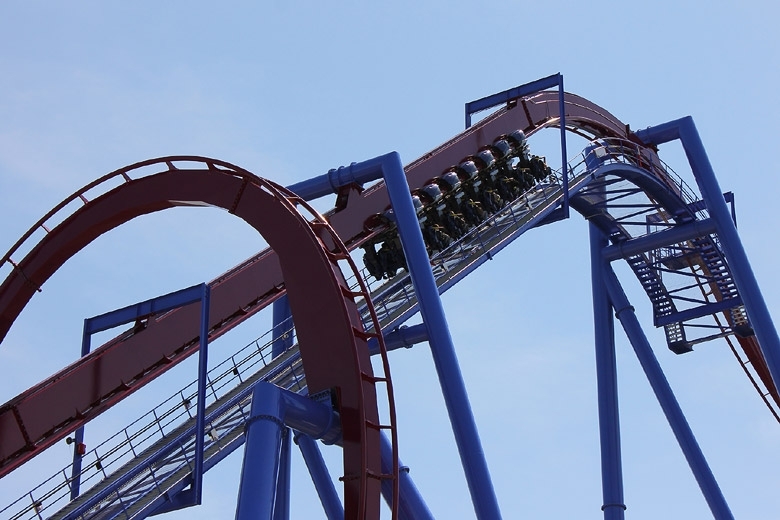 Curving into the lift hill. There were cameras and cords everywhere, especially as the opening ceremony was getting set up to begin. Once more through the dive loop! Don Helbig opens the ceremony. 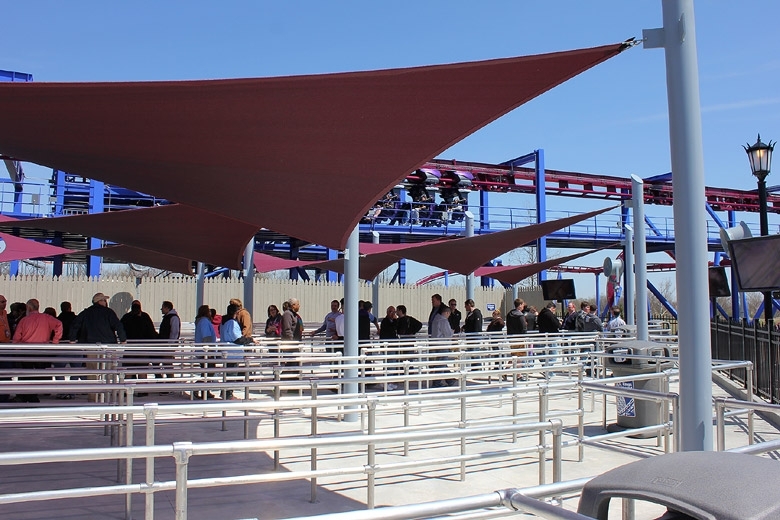 Greg Scheid talks about the decision to build Banshee. A look over the crowd at the opening ceremony. Rob Decker asks for a show of hands, though I can't recall why. Mary Cusick speaks on behalf of TourismOhio. What else was open for media day? Let's start with The Bat! 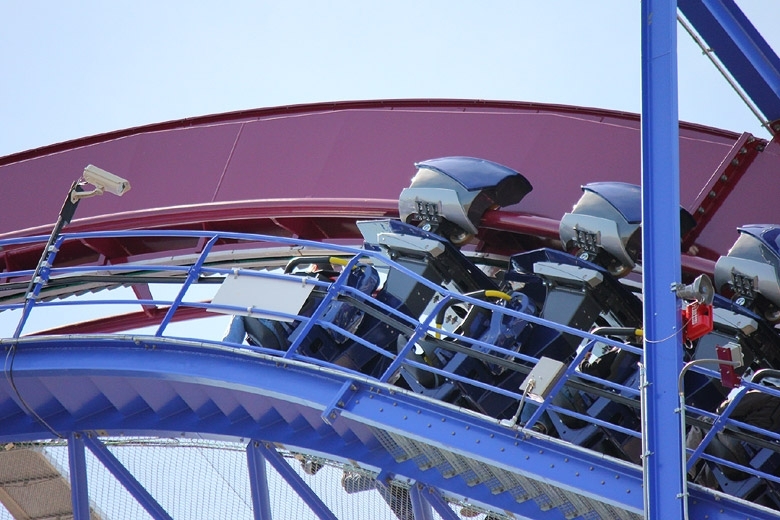 Remember the Wing Coaster leak with this logo? 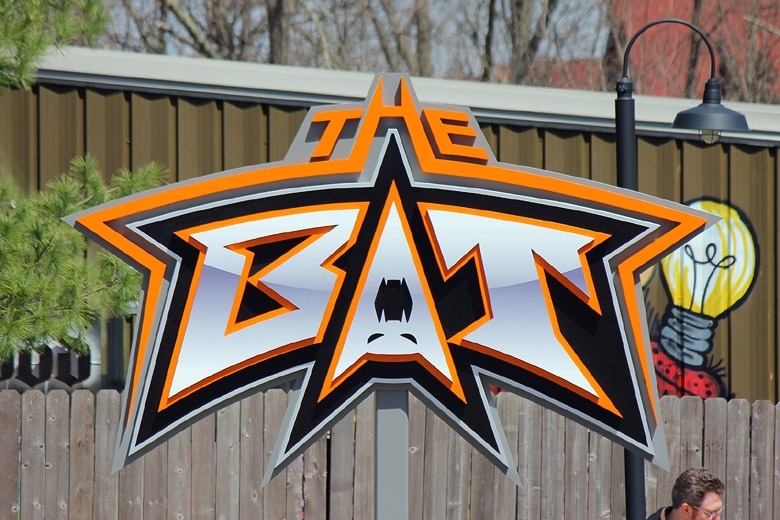 The Bat is now a pleasant shade of orange. 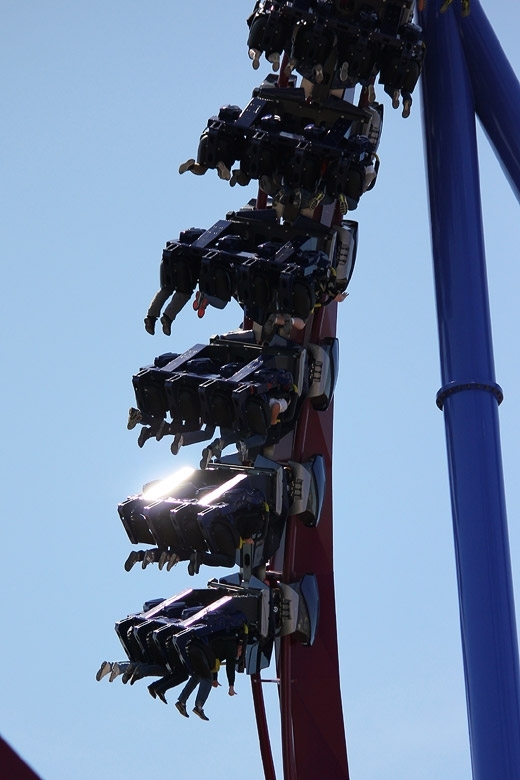 Climbing the lift hill on The Bat. 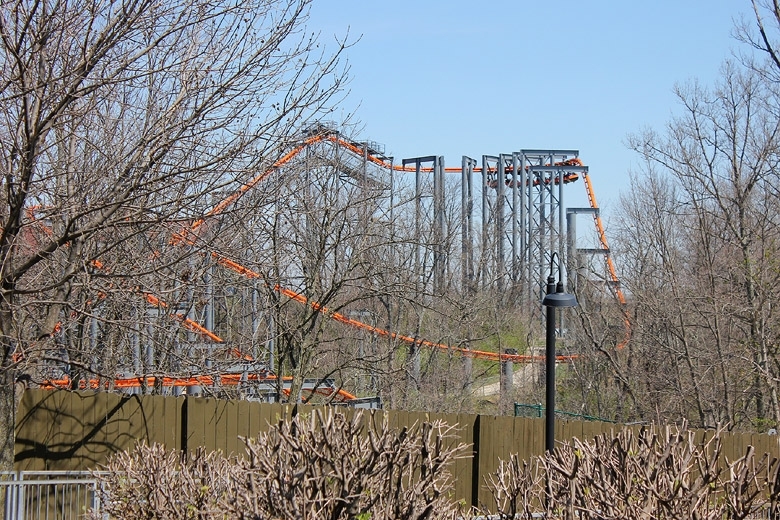 It's crazy to think that there's only five Arrow suspended coasters still operating on the planet, and Ohio has two of them. 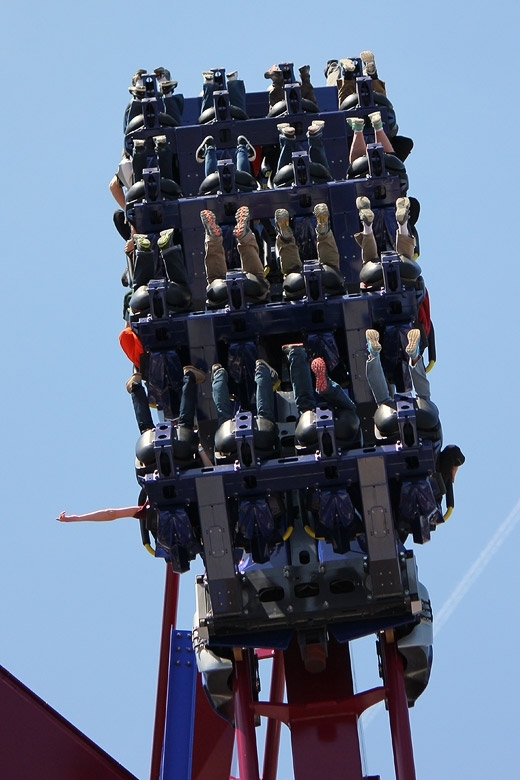 Xtreme Skyflyer was also opened up, and free of charge. 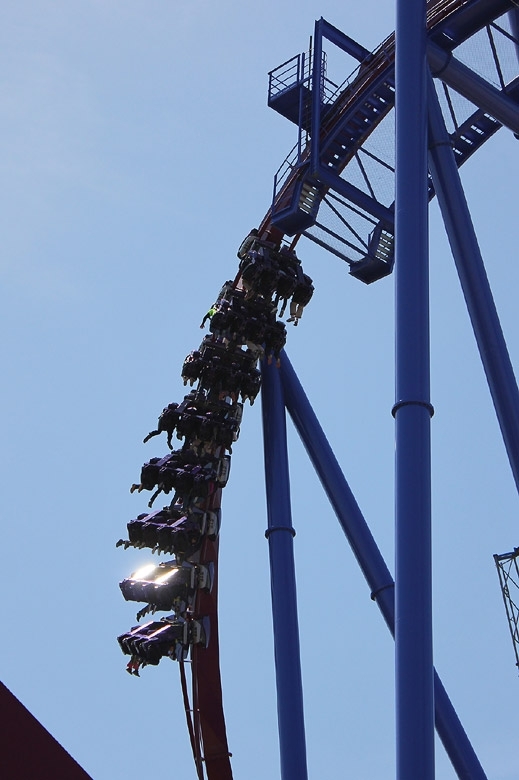 I've never been on one of these, and would have loved to give it a shot, but the line was pretty long. 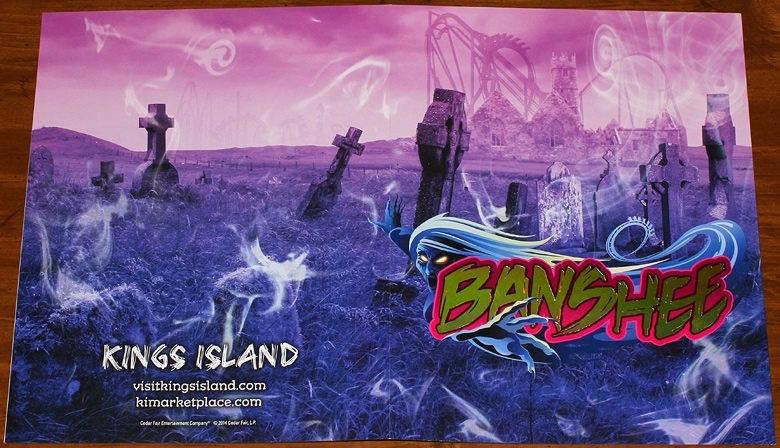 A sign for Banshee over the gift shop / photo area. Don't get into a staring contest with Eve. You're not going to win. She could probably use some nail clippers, though. 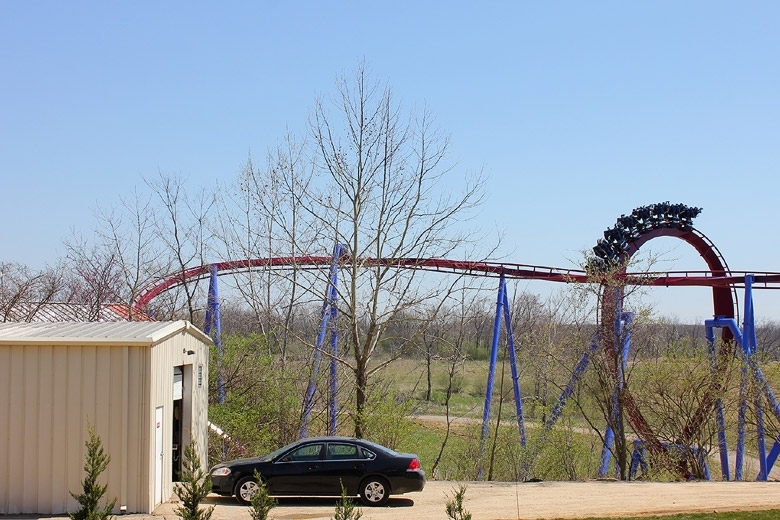 Hey look -- it's the most photographed car in Kings Island media day history! Water dummies on the third train, which remained on the transfer track through all of media day. Last edited by The Great Zo on Wed Apr 23, 2014 12:30 am. 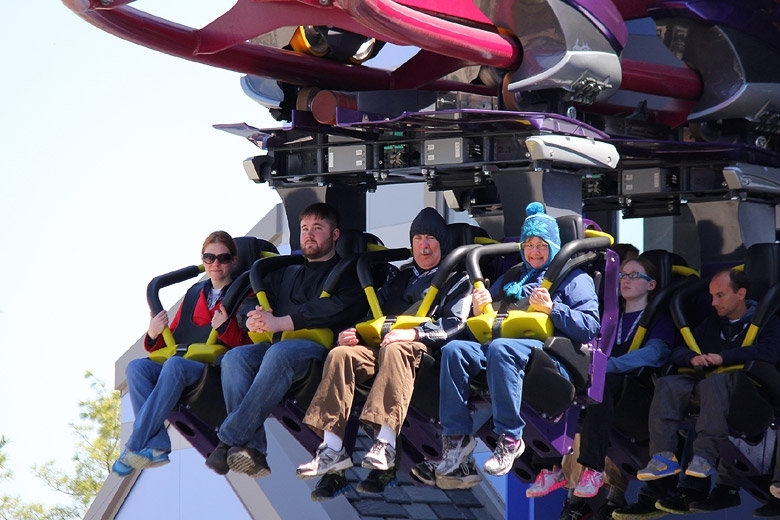 Park guests on the brake run. It's obvious from how they're dressed that it's starting to get a little bit warmer. For the drive wheel enthusiasts. 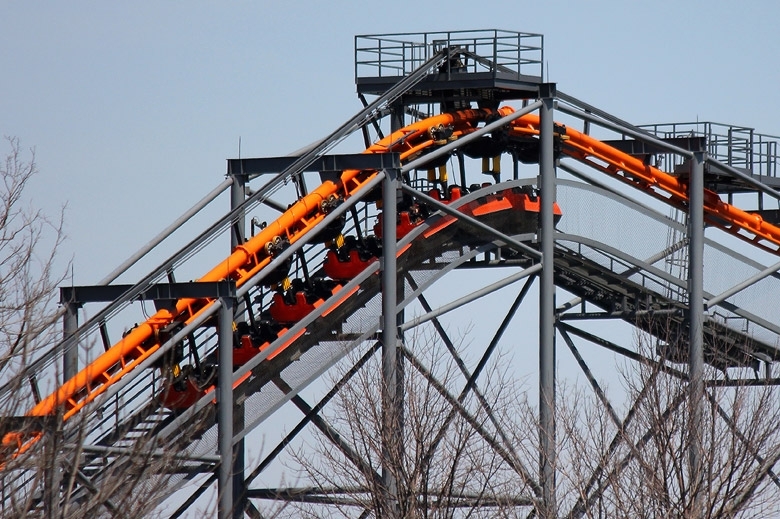 Looping around the lift hill. Row 7, far left (our right). Simply awesome. 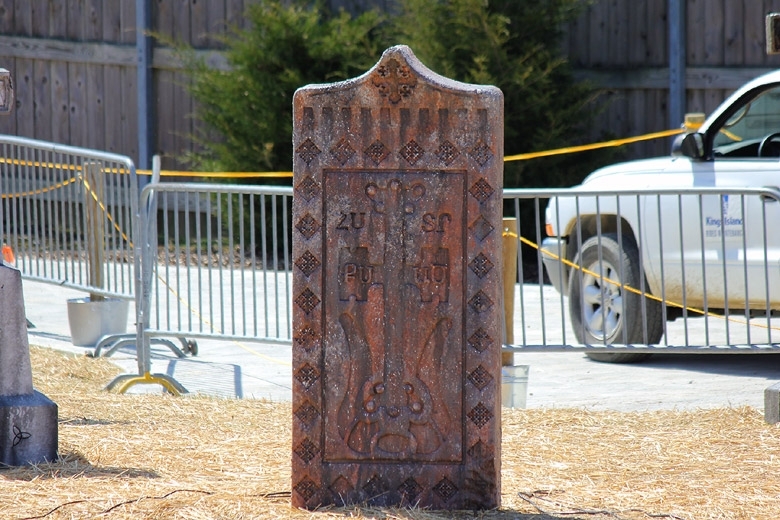 I'm sure many of the gravestones in and near the Banshee queue are inside references or jokes, but I don't know them. This one looks sort of like a guitar. Stengel? Hey, I get that one! ... or is this burning... an eternal flame? 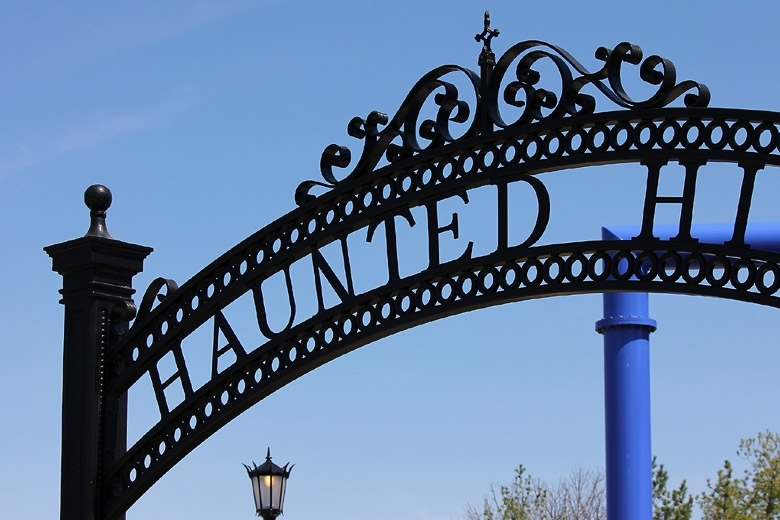 An iron gate welcomes guests to Haunted Hill -- aka the Banshee queue. 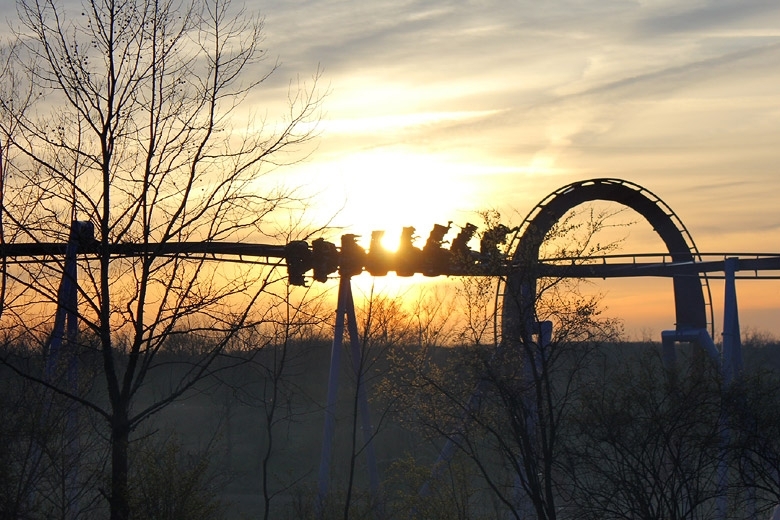 Rock over Cincinnati, rock on Kings Island. The camera's right here, if that wasn't obvious. 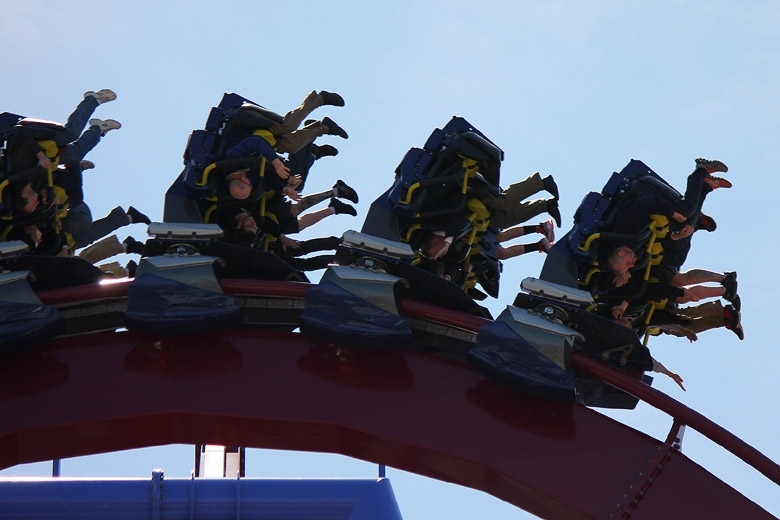 Another group heads onward to the lift hill. Flipping through the blue skies. Greg Scheid does an interview, one of many. I'd also like to take this opportunity to apologize for the interview I think I inadvertently ruined. I should have been on a constant lookout for cameras, but I walked between a subject and a camera late in the day, and realized what I did about two seconds too late. That's a crappy, helpless feeling. This ride just flat-out looks nice. As the sun got a little higher, the temperatures increased, but another problem began to develop. How, when I went out to my car at 4:30 AM in the near-freezing temperatures and pitch darkness, could I have possibly thought about sunburn later in the day? Unfortunately, my face and ears took a little bit of a pre-season beating. 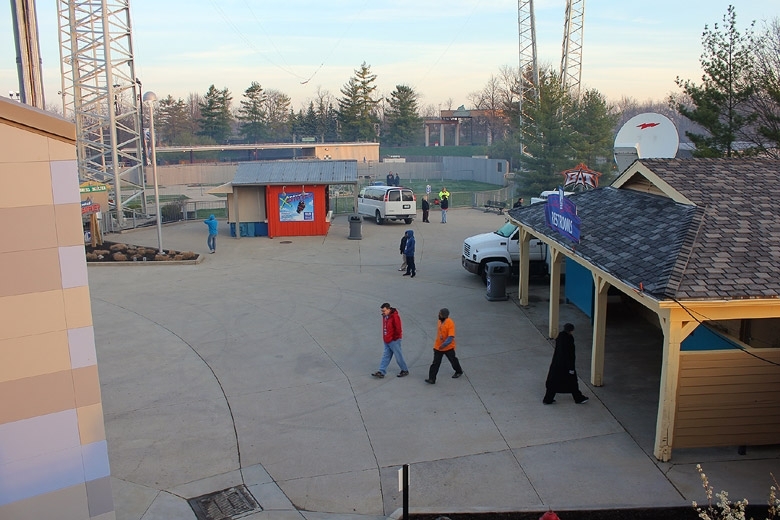 The next few pictures show a bit of a view over the reconstructed section of Action Zone. 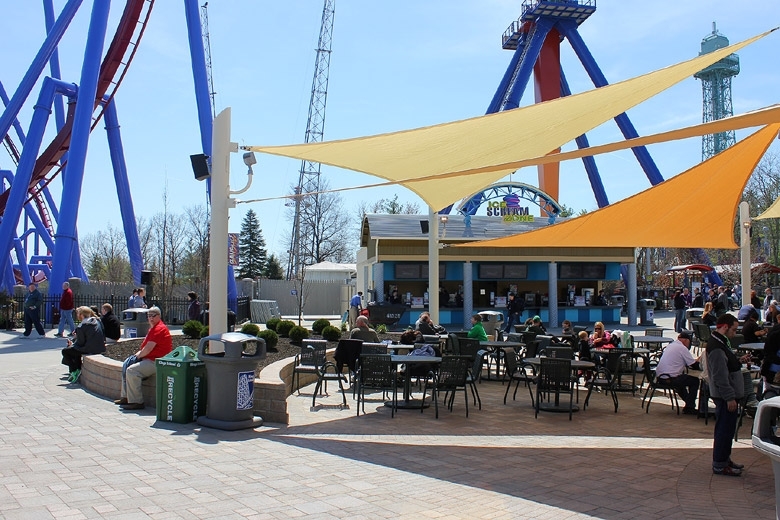 Ice Scream Zone is the home of the Banshee Twist ice cream. Delirium looks a little different this year. 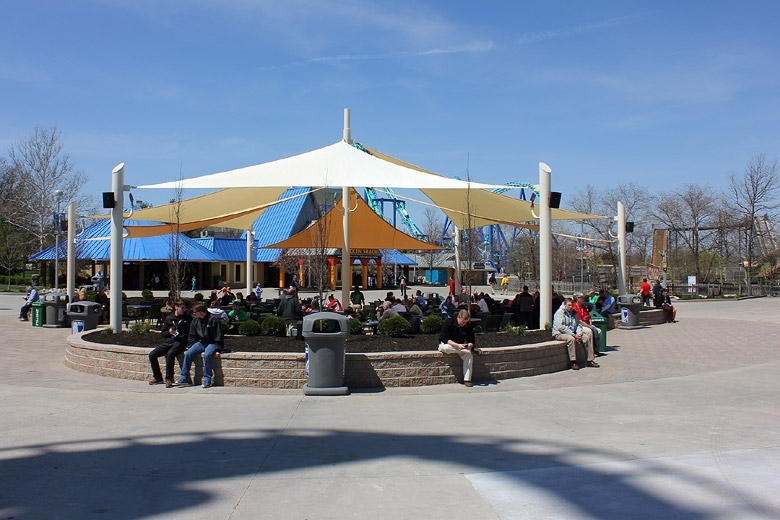 Here's a big new shaded seating area. The new Chicken Shack restaurant is just behind it. 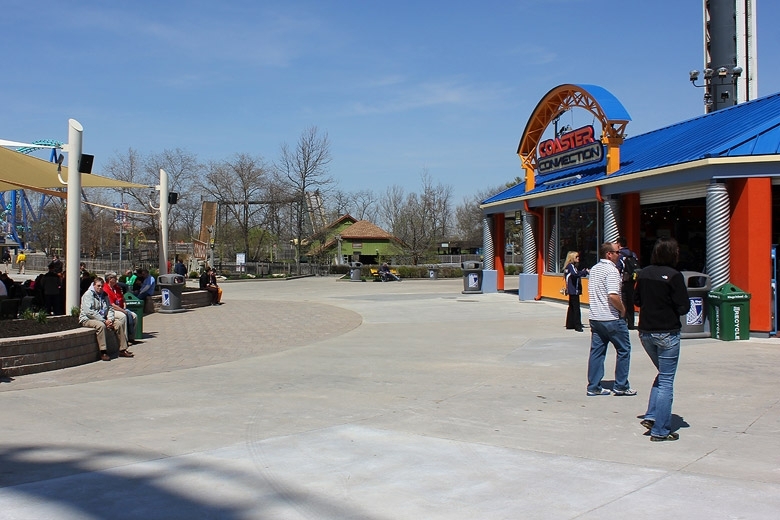 Coaster Connection (a gift shop) is right across from Banshee, with Congo Falls a little further down the path. Here's a reverse view of the seating area. 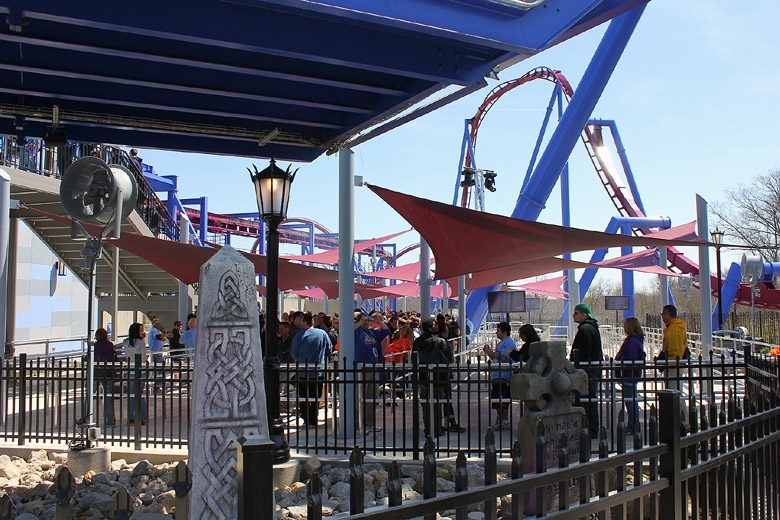 The Banshee queue entrance is just off-frame to the left. 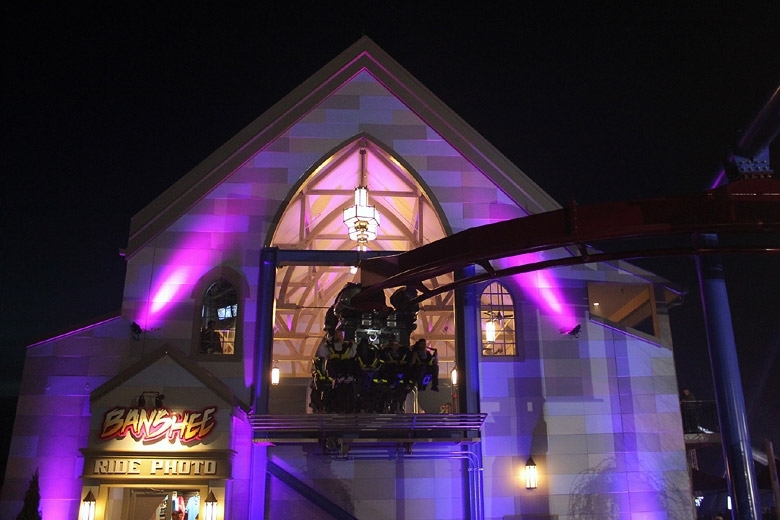 There weren't too many places to get good pictures of the first drop, though I read that the overflow queue (behind Delirium and Ice Scream Zone) would have been an excellent spot. This was about as close as I could get. The main accessible path does almost get right underneath the dive loop. Now, for a few pictures of the queue. This is probably about a 20-25 minute wait. 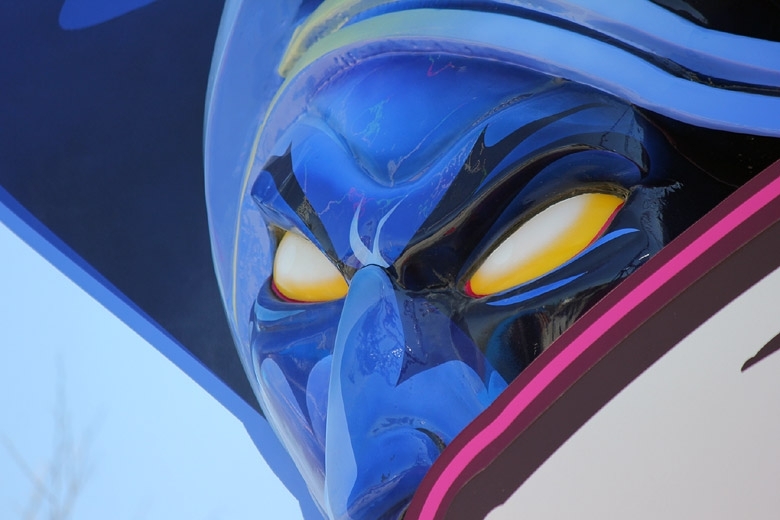 The eyes of Son of Beast are watching from beyond the grave, which actually kind of fits the whole Banshee theme. 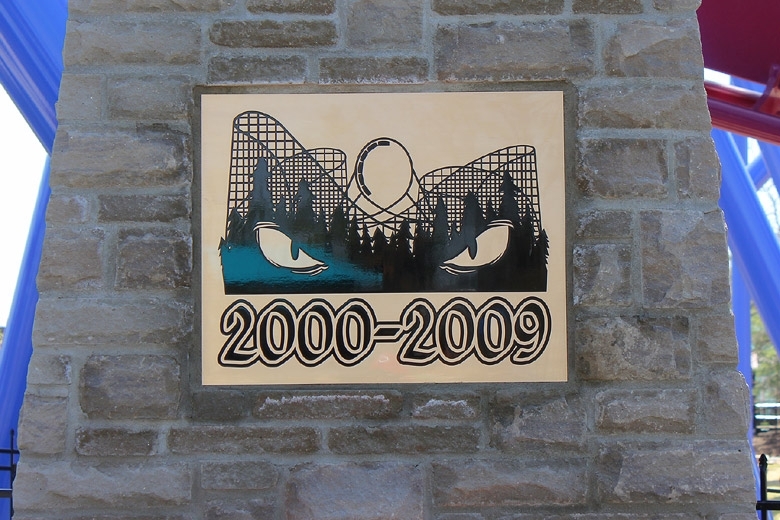 I absolutely love the Son of Beast memorial. I love it, and it tells me that the park gets it. 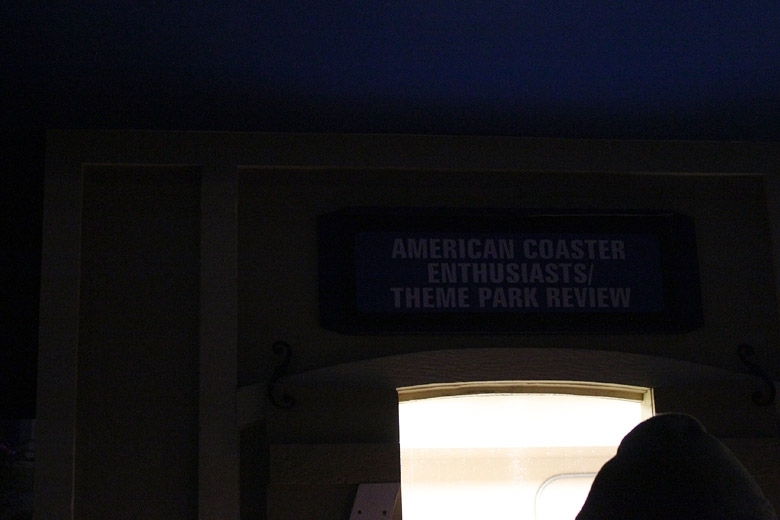 I think there were a few people that took this too seriously, as if the park meant it in a completely sincere way. 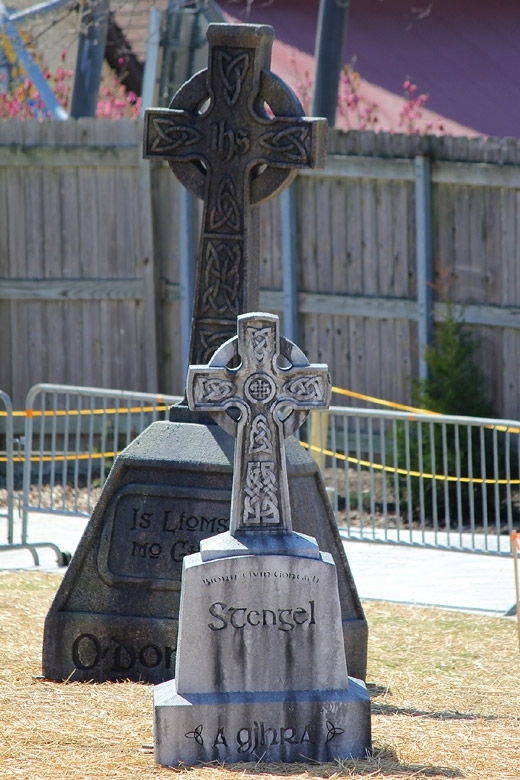 One look around the queue area tells me all I need to know -- the Son of Beast monument is /by far/ the largest object in the graveyard. 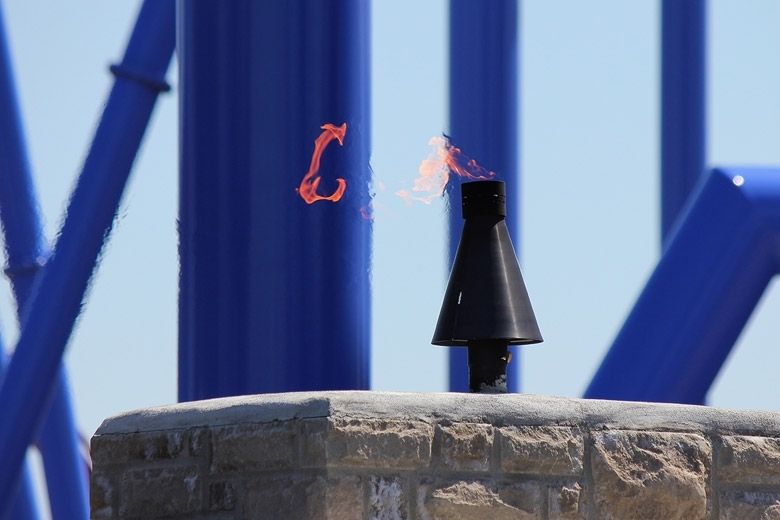 It's even adorned with an "eternal flame" on top, as if to say "never forget!" 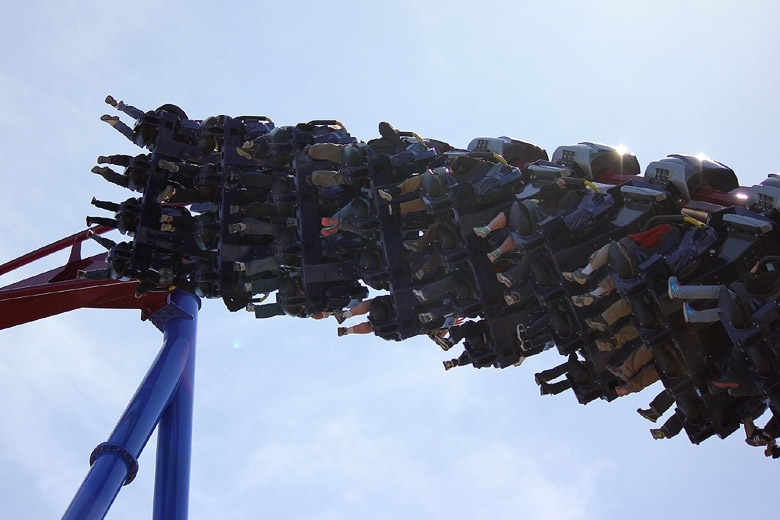 Let's be honest -- no one who's ridden Son of Beast is going to forget it, and for all the wrong reasons. The park knows this. Want proof? Look at what's standing in its spot today. 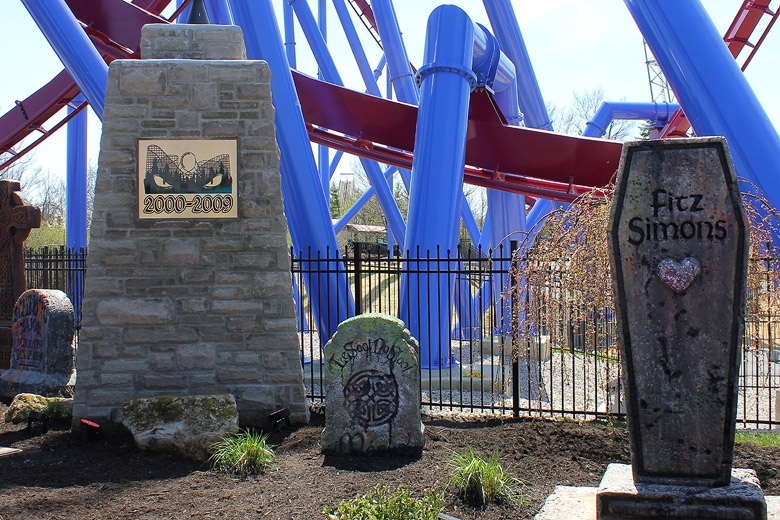 Son of Beast is gone, and the fact that Banshee exists (not to mention the go-kart joke from the ceremony) is proof that the park knows it was a turkey. How do you celebrate a turkey, while still providing a nod to the past? By building the most ridiculous, gigantic, unnecessary monument to the worst roller coaster I've ever been on. This was a stroke of brilliance. A view from under the lift. Diving over the eternal flame. 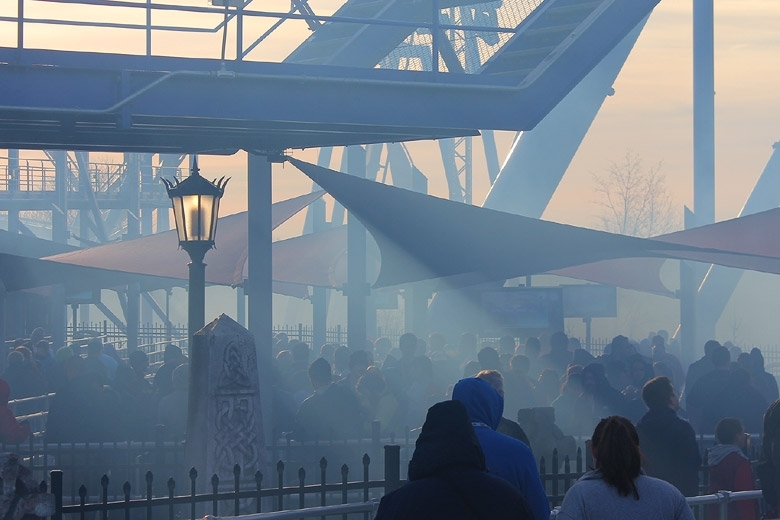 Fog rises from the queue. Here's one side of the queue, which runs next to one of the main sections of the graveyard. This is the main part of the queue, with the steps to the station behind it. Here's the far back section of the queue, which offers some views down the hill into the ride's second half. 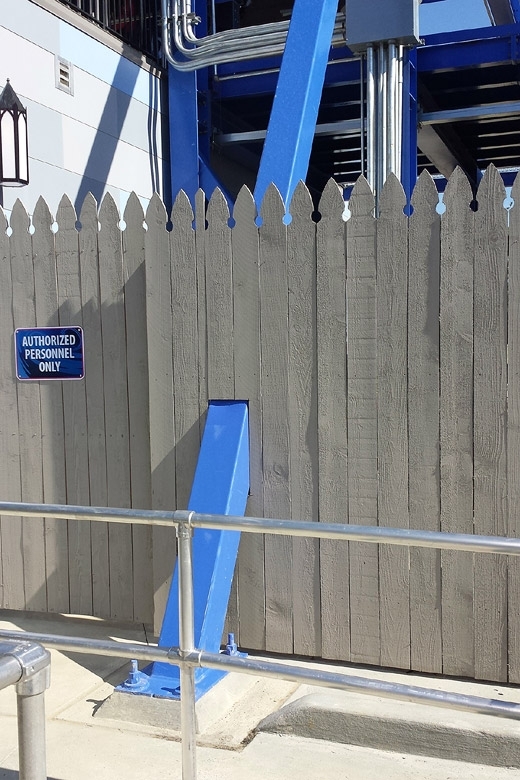 Stacy noticed this and I thought it was awesome -- a fence built completely around a support. 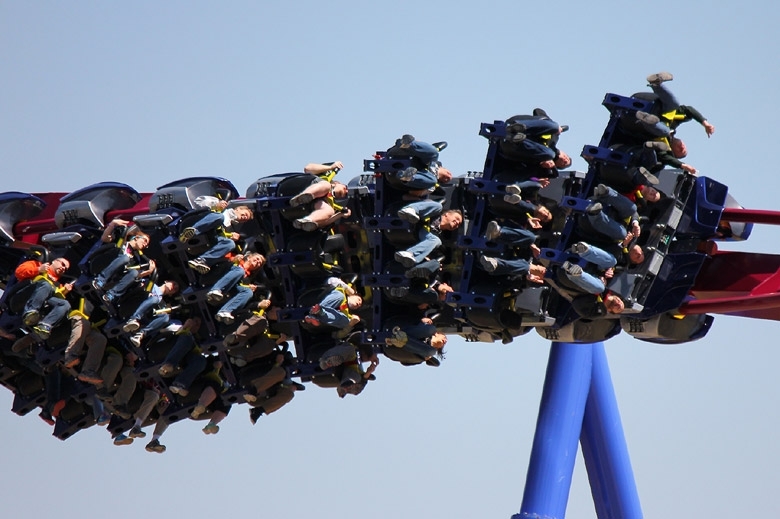 Another train full of excited Banshee riders. 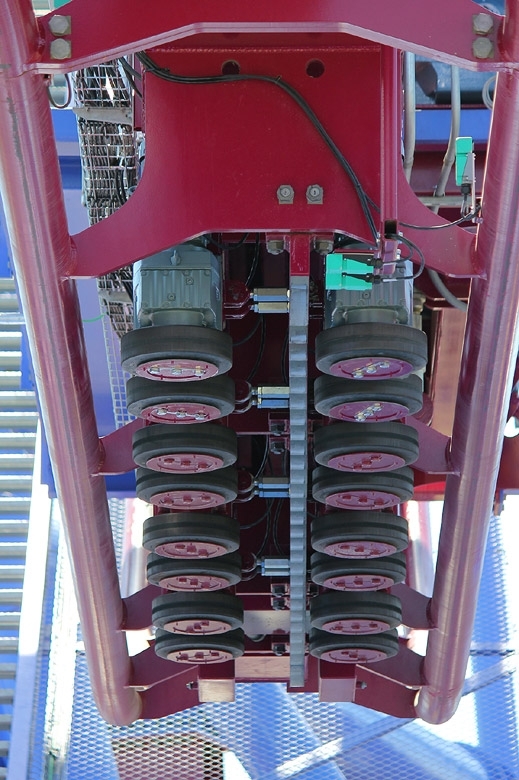 Coming through the final helix before the brake run. A turn into the brake run, which is obviously the most disappointing part of the ride. 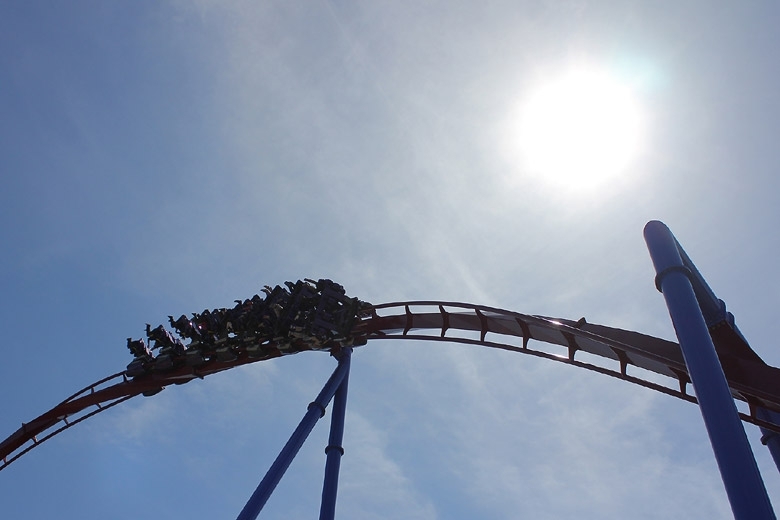 Catching the sun off a car on Banshee's steep first drop. 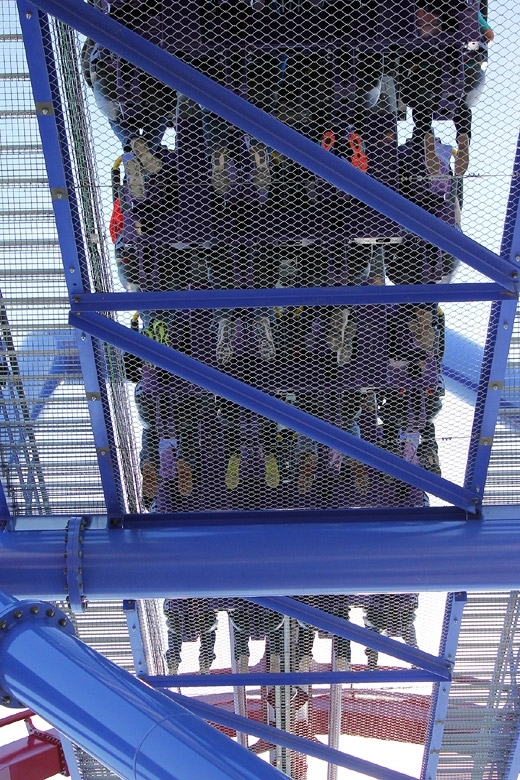 A look up at the zero-g roll. The second half of the batwing / pretzel, which is huge. 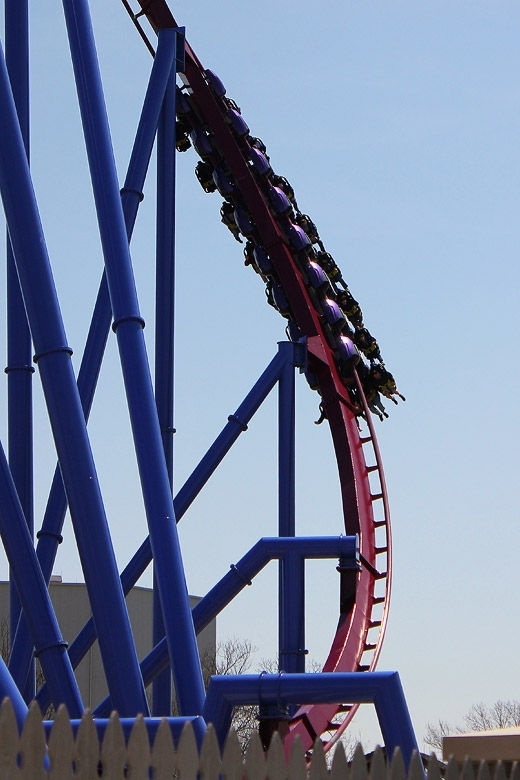 Coming out of the second vertical loop, this turn is one of the most intense parts of the ride. 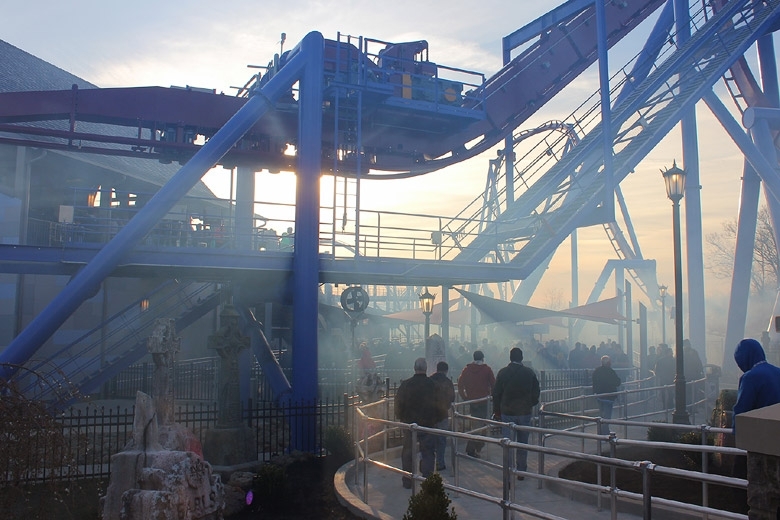 A view over toward the Flight of Fear building. 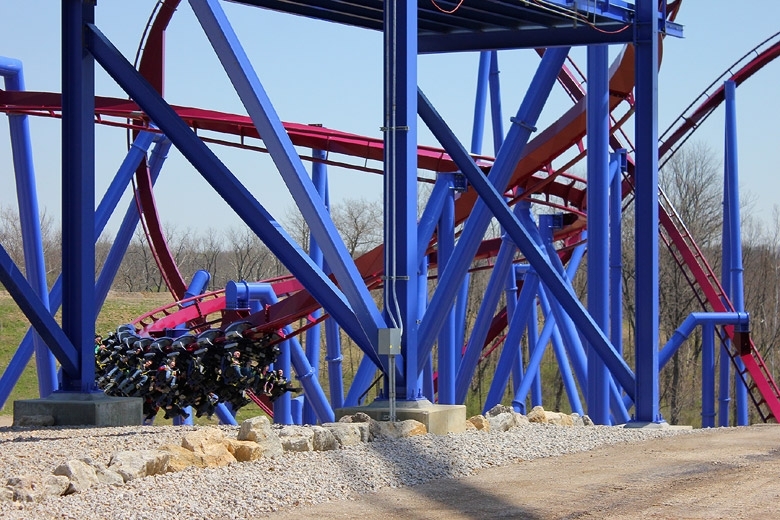 A few sections of Adventure Express track are also visible from Banshee's queue. 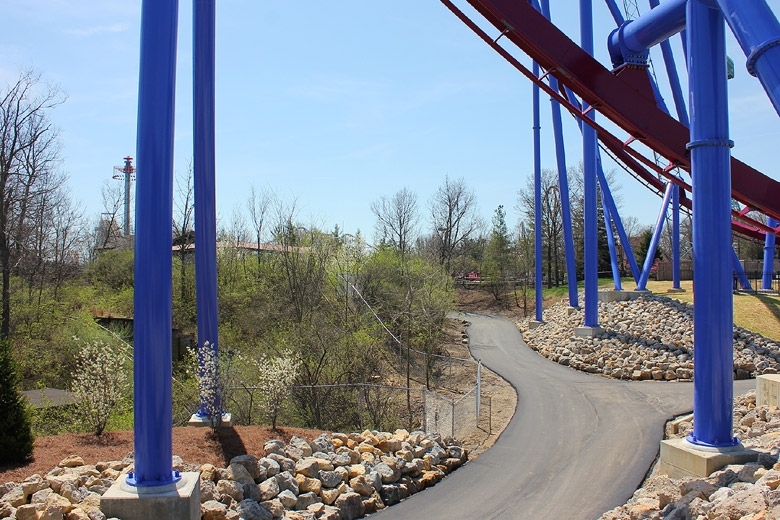 A look at a service road under Banshee. 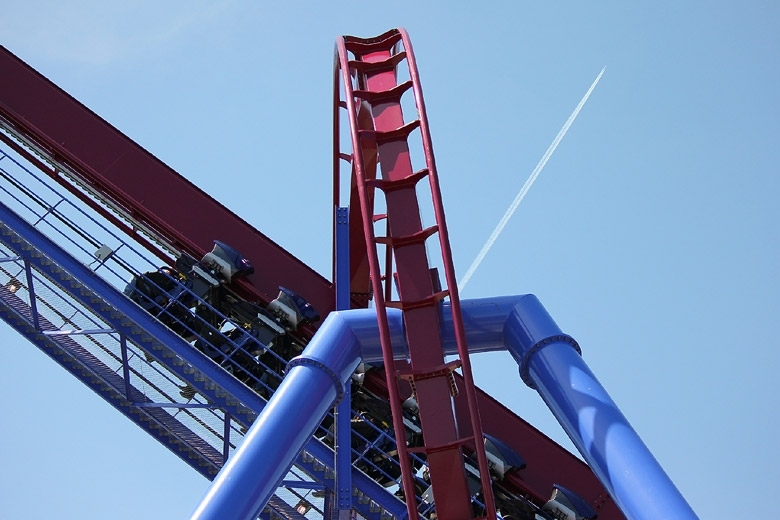 Weird angles in this shot -- lift hill, vertical loop, airplane. Private eyes -- they're watching you! 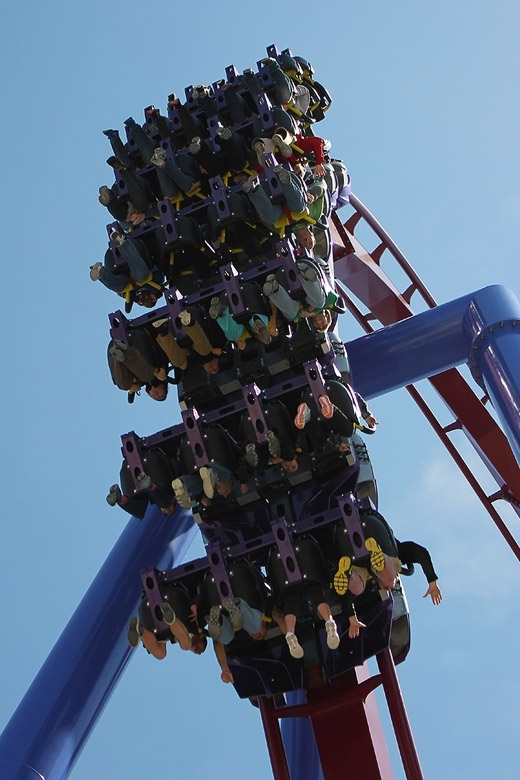 Another view of the big drop. Nothing but feet -- and one arm. Rolling through the middle of the course. Dropping into the ravine -- one of my favorite parts of the ride. 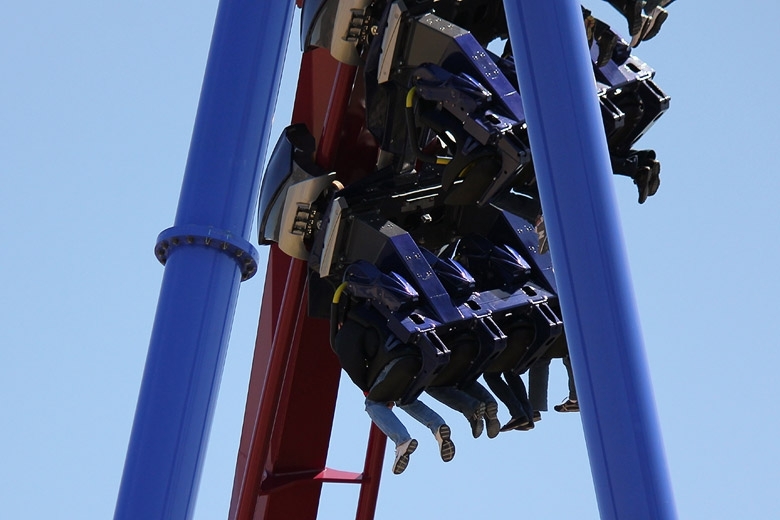 Flipping upside down, which is actually fairly comfortable in Banshee's restraints. 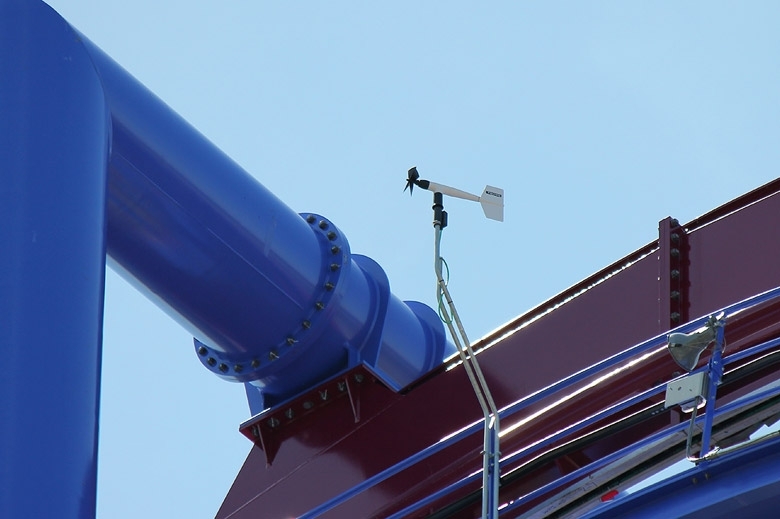 OK, how do I get access to the wind readings from up there? Diving into the valley from the zero-g roll. The trim brake is visible here, but I don't know for sure if it was used. Seeing how low on the hill it's positioned, I'm thinking that it probably wasn't on. 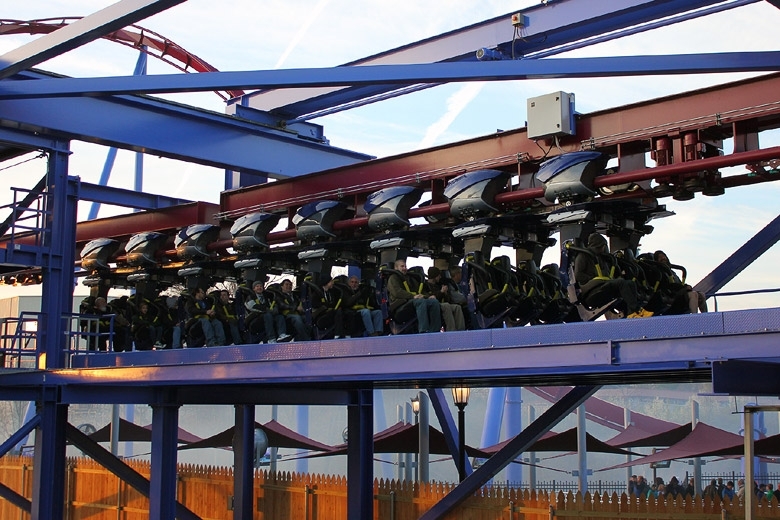 Flying into the brake run to complete the circuit. 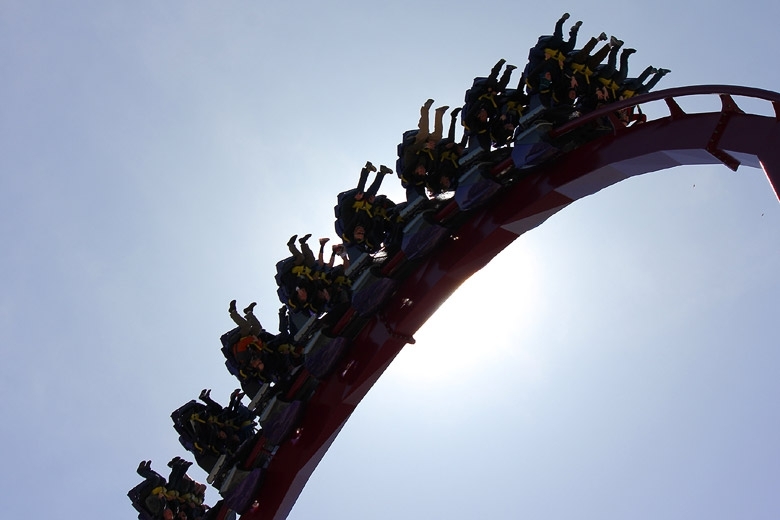 This is the only chance to catch your breath -- the end of the ride. Banshee's a bit of a whirlwind. 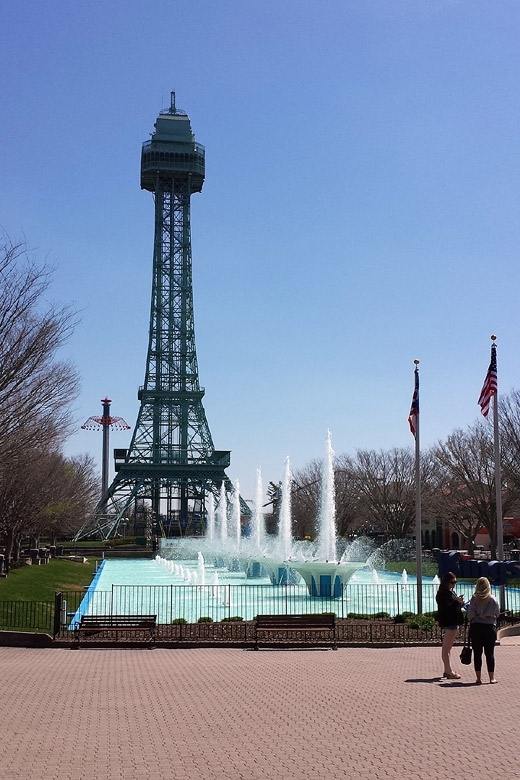 A shot of the iconic fountains and Eiffel Tower on the way out of the park, just after 2 PM. 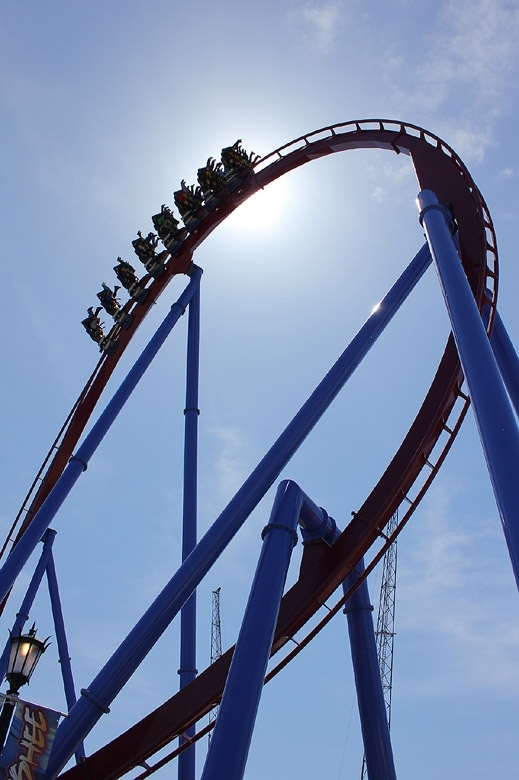 Thank you Kings Island for an outstanding (and tiring) day! The best media day report ever. Summed up the entire experience perfectly. Great photos (especially the early morning ones). For someone who couldn't go, this is easily the next best thing. Great work! My feet are represented several times in your photographs. You should seriously send this picture to Don Helbig. Andy, great trip report! Thumbs up! Don really needs to see these. Wow! Thanks for the great photos. 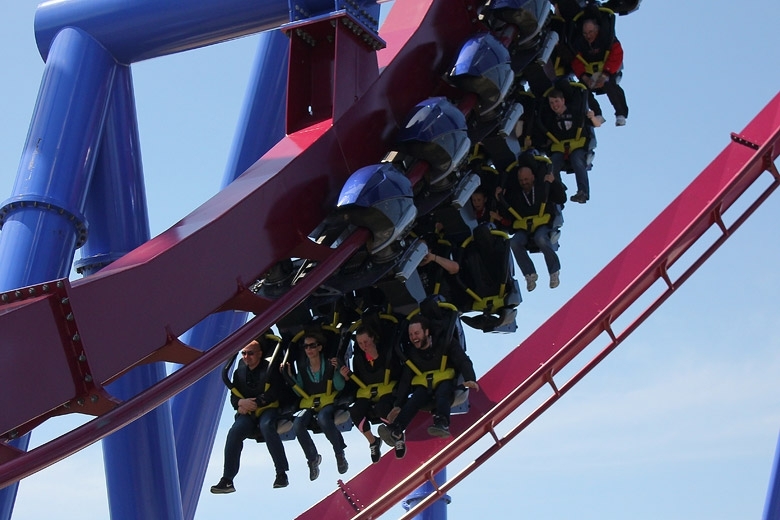 It's nice to hear even more positive reviews for this ride. I might have to eat my words about it being forceless... which is great. Andy, Great TR...I haven't been to KI since 2005, now it looks like I'll have to go back! Who are you rooting for in the Metro Playoffs? CBJ? I'm a Sabres Fan, but I really like this year's Columbus team, and I'm rooting for them in the east.